"Al-Qaidah" redirects here. For the Iraqi newspaper, see Al-Qaidah (newspaper). Al-Qaeda (/ælˈkaɪdə, ˌælkɑːˈiːdə/; Arabic: القاعدة‎ al-Qāʿidah, IPA: [ælqɑːʕɪdɐ], translation: "The Base", "The Foundation" or "The Database", alternatively spelled al-Qaida and al-Qa'ida) is a militant Sunni Islamist multi-national organization founded in 1988 by Osama bin Laden, Abdullah Azzam, and several other Arab volunteers during the Soviet invasion of Afghanistan. Al-Qaeda operates as a network of Islamic extremists and Salafist jihadists. The organization has been designated as a terrorist group by the United Nations Security Council, the North Atlantic Treaty Organization (NATO), the European Union, the United States, the United Kingdom, Russia, India, and various other countries (see below). Al-Qaeda has mounted attacks on non-military and military targets in various countries, including the 1998 United States embassy bombings, the September 11 attacks, and the 2002 Bali bombings. The United States government responded to the September 11 attacks by launching the "War on Terror", which sought to undermine al-Qaeda and its allies. The deaths of key leaders, including that of Osama bin Laden, have led al-Qaeda's operations to shift from the top down organization and planning of attacks, to the planning of attacks which are carried out by associated groups and lone-wolf operators. Al-Qaeda characteristically employs attacks which include suicide attacks and the simultaneous bombing of several targets. Activities which are ascribed to al-Qaeda involve the actions of those who have made a pledge of loyalty to bin Laden, or to the actions of "al-Qaeda-linked" individuals who have undergone training in one of its camps in Afghanistan, Pakistan, Iraq or Sudan. Al-Qaeda ideologues envision the removal of all foreign influences in Muslim countries, and the creation of a new caliphate ruling over the entire Muslim world. Among the beliefs ascribed to al-Qaeda members is the conviction that a Christian–Jewish alliance is conspiring to destroy Islam. As Salafist jihadists, members of al-Qaeda believe that the killing of non-combatants is religiously sanctioned. This belief ignores the aspects of religious scripture which forbid the murder of non-combatants and internecine fighting. Al-Qaeda also opposes what it regards as man-made laws, and wants to replace them with a strict form of sharia law. Al-Qaeda has carried out many attacks on targets which it considers kafir. Al-Qaeda is also responsible for instigating sectarian violence among Muslims. Al-Qaeda's leaders regard liberal Muslims, Shias, Sufis and other sects as heretical and its members and sympathizers have attacked their mosques and gatherings. Examples of sectarian attacks include the Yazidi community bombings, the Sadr City bombings, the Ashoura massacre and the April 2007 Baghdad bombings. Following the death of bin Laden in 2011, the group has been led by Egyptian Ayman al-Zawahiri. Al-Qaeda's philosophy calls for the centralization of decision making, while allowing for the decentralization of execution. However, after the War on Terror, al-Qaeda's leadership has become isolated. As a result, the leadership has become decentralized, and the organization has become regionalized into several al-Qaeda groups. Many terrorism experts do not believe that the global jihadist movement is driven at every level by al-Qaeda's leadership. However, bin Laden held considerable ideological sway over some Muslim extremists before his death. Experts argue that al-Qaeda has fragmented into a number of disparate regional movements, and that these groups bear little connection with one another. this matter isn't about any specific person and... is not about the al-Qa'idah Organization. We are the children of an Islamic Nation, with Prophet Muhammad as its leader, our Lord is one... and all the true believers [mu'mineen] are brothers. So the situation isn't like the West portrays it, that there is an 'organization' with a specific name (such as 'al-Qa'idah') and so on. That particular name is very old. It was born without any intention from us. Brother Abu Ubaida... created a military base to train the young men to fight against the vicious, arrogant, brutal, terrorizing Soviet empire... So this place was called 'The Base' ['Al-Qa'idah'], as in a training base, so this name grew and became. We aren't separated from this nation. We are the children of a nation, and we are an inseparable part of it, and from those public *** which spread from the far east, from the Philippines, to Indonesia, to Malaysia, to India, to Pakistan, reaching Mauritania... and so we discuss the conscience of this nation. Bruce Hoffman, however, sees al-Qaeda as a cohesive network that is strongly led from the Pakistani tribal areas. Osama bin Laden was the Senior Operations Chief of al-Qaeda prior to his assassination by US forces on May 1, 2011. 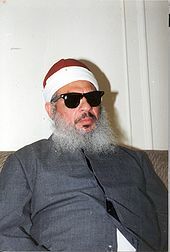 Atiyah Abd al-Rahman was alleged to be second in command prior to his death on August 22, 2011. Bin Laden was advised by a Shura Council, which consists of senior al-Qaeda members. The group was estimated to consist of 20–30 people. One such member is thought to have been Sayed Tayib al-Madani. 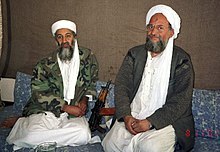 Ayman al-Zawahiri had been al-Qaeda's Deputy Operations Chief and assumed the role of commander after bin Laden's death. Al-Zawahiri replaced Saif al-Adel, who had served as interim commander. On June 5, 2012, Pakistani intelligence officials announced that al-Rahman's alleged successor Abu Yahya al-Libi had been killed in Pakistan. Nasir al-Wuhayshi was said to have become second in command in 2013. He was the leader of al-Qaeda in the Arabian Peninsula (AQAP), until he was killed in a US airstrike in June 2015. The Military Committee, which is responsible for training operatives, acquiring weapons, and planning attacks. The Money/Business Committee, which funds the recruitment and training of operatives through the hawala banking system. US-led efforts to eradicate the sources of "terrorist financing" were most successful in the year immediately following the September 11 attacks. Al-Qaeda continues to operate through unregulated banks, such as the 1,000 or so hawaladars in Pakistan, some of which can handle deals of up to US$10 million. The committee also procures false passports, pays al-Qaeda members, and oversees profit-driven businesses. In the 9/11 Commission Report, it was estimated that al-Qaeda required $30 million-per-year to conduct its operations. The Law Committee reviews Sharia law, and decides upon courses of action conform to it. The Media Committee ran the now-defunct newspaper Nashrat al Akhbar (English: Newscast) and handled public relations. Al-Qaeda is not operationally managed by Ayman al-Zawahiri. Several operational groups exist, which consult with the leadership in situations where attacks are in preparation. When asked in 2005 about the possibility of al-Qaeda's connection to the July 7, 2005 London bombings, Metropolitan Police Commissioner Sir Ian Blair said: "Al-Qaeda is not an organization. Al-Qaeda is a way of working... but this has the hallmark of that approach... al-Qaeda clearly has the ability to provide training... to provide expertise... and I think that is what has occurred here." On August 13, 2005, The Independent newspaper, reported that the July 7 bombers had acted independently of an al-Qaeda mastermind. There were selective portions of al-Fadl's testimony that I believe was false, to help support the picture that he helped the Americans join together. I think he lied in a number of specific testimony about a unified image of what this organization was. It made al-Qaeda the new Mafia or the new Communists. It made them identifiable as a group and therefore made it easier to prosecute any person associated with al-Qaeda for any acts or statements made by bin Laden. Pakistani journalist Hamid Mir interviewing Osama bin Laden in Afghanistan, 1997. The number of individuals in the group who have undergone proper military training, and are capable of commanding insurgent forces, is largely unknown. Documents captured in the raid on bin Laden's compound in 2011 show that the core al-Qaeda membership in 2002 was 170. 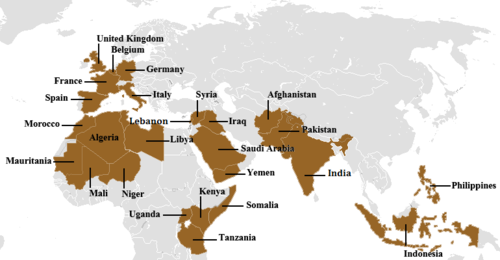 In 2006, it was estimated that al-Qaeda had several thousand commanders embedded in 40 different countries. As of 2009[update], it was believed that no more than 200–300 members were still active commanders. According to the 2004 BBC documentary The Power of Nightmares, al-Qaeda was so weakly linked together that it was hard to say it existed apart from bin Laden and a small clique of close associates. The lack of any significant numbers of convicted al-Qaeda members, despite a large number of arrests on terrorism charges, was cited by the documentary as a reason to doubt whether a widespread entity that met the description of al-Qaeda existed. According to author Robert Cassidy, al-Qaeda maintains two separate forces which are deployed alongside insurgents in Iraq and Pakistan. The first, numbering in the tens of thousands, was "organized, trained, and equipped as insurgent combat forces" in the Soviet–Afghan war. The force was composed primarily of foreign mujahideen from Saudi Arabia and Yemen. Many of these fighters went on to fight in Bosnia and Somalia for global jihad. Another group, which numbered 10,000 in 2006, live in the West and have received rudimentary combat training. Other analysts have described al-Qaeda's rank and file as being "predominantly Arab" in its first years of operation, but that the organization also includes "other peoples" as of 2007[update]. It has been estimated that 62% of al-Qaeda members have university education. In the 1990s, financing for al-Qaeda came partly from the personal wealth of Osama bin Laden. Other sources of income included the heroin trade and donations from supporters in Kuwait, Saudi Arabia and other Islamic Gulf states. A WikiLeaks-released 2009 internal U.S. government cable stated that "terrorist funding emanating from Saudi Arabia remains a serious concern". Among the first pieces of evidence regarding Saudi Arabia's support for al-Qaeda was the so-called "Golden Chain", a list of early al-Qaeda funders seized during a 2002 raid in Sarajevo by Bosnian police. The hand-written list was validated by al-Qaeda defector Jamal al-Fadl, and included the names of both donors and beneficiaries. Osama bin-Laden's name appeared seven times among the beneficiaries, while 20 Saudi and Gulf-based businessmen and politicians were listed among the donors. Notable donors included Adel Batterjee, and Wael Hamza Julaidan. Batterjee was designated as a terror financier by the US Department of the Treasury in 2004, and Julaidan is recognized as one of al-Qaeda's founders. Documents seized during the 2002 Bosnia raid showed that al-Qaeda widely exploited charities to channel financial and material support to its operatives across the globe. Notably, this activity exploited the International Islamic Relief Organization (IIRO) and the Muslim World League (MWL). The IIRO had ties with al-Qaeda associates worldwide, including al-Qaeda's deputy Ayman al Zawahiri. Zawahiri's brother worked for the IIRO in Albania and had actively recruited on behalf of al-Qaeda. The MWL was openly identified by al-Qaeda's leader as one of the three charities al-Qaeda primarily relied upon for funding sources. Several Qatari citizens have been accused of funding al-Qaeda. This includes Abd Al-Rahman al-Nuaimi, a Qatari citizen and a human-rights activist who founded the Swiss-based non-governmental organization (NGO) Alkarama. On December 18, 2013, the US Treasury designated Nuaimi as a terrorist for his activities supporting al-Qaeda. The US Treasury has stated that Nuaimi "has facilitated significant financial support to al-Qaeda in Iraq, and served as an interlocutor between al-Qaeda in Iraq and Qatar-based donors". Nuaimi was accused of overseeing a $2 million monthly transfer to al-Qaeda in Iraq as part of his role as mediator between Iraq-based al-Qaeda senior officers and Qatari citizens. Nuaimi allegedly entertained relationships with Abu-Khalid al-Suri, al-Qaeda's top envoy in Syria, who processed a $600,000 transfer to al-Qaeda in 2013. Nuaimi is also known to be associated with Abd al-Wahhab Muhammad 'Abd al-Rahman al-Humayqani, a Yemeni politician and founding member of Alkarama, who was listed as a Specially Designated Global Terrorist (SDGT) by the US Treasury in 2013. The US authorities claimed that Humayqani exploited his role in Alkarama to fundraise on behalf of al-Qaeda in the Arabian Peninsula (AQAP). A prominent figure in AQAP, Nuaimi was also reported to have facilitated the flow of funding to AQAP affiliates based in Yemen. Nuaimi was also accused of investing funds in the charity directed by Humayqani to ultimately fund AQAP. About ten months after being sanctioned by the US Treasury, Nuaimi was also restrained from doing business in the UK. Another Qatari citizen, Kalifa Mohammed Turki Subayi, was sanctioned by the US Treasury on June 5, 2008, for his activities as a "Gulf-based al-Qaeda financier". Subayi's name was added to the UN Security Council's Sanctions List in 2008 on charges of providing financial and material support to al-Qaeda senior leadership. Subayi allegedly moved al-Qaeda recruits to South Asia-based training camps. He also financially supported Khalid Sheikh Mohammed, a Pakistani national and senior al-Qaeda officer who is believed to be the mastermind behind the September 11 attack according to the September 11 Commission report. Qataris provided support to al-Qaeda through the country's largest NGO, the Qatar Charity. Al-Qaeda defector al-Fadl, who was a former member of Qatar Charity, testified in court that Abdullah Mohammed Yusef, who served as Qatar Charity's director, was affiliated to al-Qaeda and simultaneously to the National Islamic Front, a political group that gave al-Qaeda leader Osama Bin Laden harbor in Sudan in the early 1990s. Legal proceedings from the trial United States vs. Enaam M. Arnaout revealed that Qatar Charity was cited by Bin Laden in 1993 as one of the charities used to channel financial support to al-Qaeda operatives overseas. The same documents also report Bin Laden's complaint that the failed assassination attempt of Egyptian President Hosni Mubarak had compromised the ability of al-Qaeda to exploit charities to support its operatives to the extent that it was capable of before 1995. It is alleged[who?] that the Qatar Charity gave financial support to members of al-Qaeda in Chechnya. This accusation was publicly denied by Hamad bin Nasser al-Thani. Qatar Charity is among the NGOs allegedly channelling funds to Ansar Dine in North Mali, according to French military intelligence reports from France's intervention in the country in early 2013. Qatar finances al-Qaeda's enterprises through al-Qaeda's affiliate in Syria, Jabhat al-Nusra. The funding is primarily channeled through kidnapping for ransom. The Consortium Against Terrorist Finance (CATF) reported that the Gulf country has funded al-Nusra since 2013. Al-Awsat estimated that Qatar disbursed $25 million in support of al-Nusra through kidnapping for ransom. In addition, Qatar has launched fundraising campaigns on behalf of al-Nusra. Al-Nusra acknowledged a Qatar-sponsored campaign "as one of the preferred conduits for donations intended for the group". The US economy will finally collapse by the year 2020, under the strain of multiple engagements in numerous places. This will lead to a collapse in the worldwide economic system, and lead to global political instability. This will lead to a global jihad led by al-Qaeda, and a Wahhabi Caliphate will then be installed across the world. Atwan noted that, while the plan is unrealistic, "it is sobering to consider that this virtually describes the downfall of the Soviet Union." "The Awakening." This phase was supposed to last from 2001 to 2003. The goal of the phase is to provoke the United States to attack a Muslim country by executing an attack on US soil that kills many civilians. "Opening Eyes." This phase was supposed to last from 2003 to 2006. The goal of this phase was to recruit young men to the cause and to transform the al-Qaeda group into a movement. Iraq was supposed to become the center of all operations with financial and military support for bases in other states. "Arising and Standing up", was supposed to last from 2007 to 2010. In this phase, al-Qaeda wanted to execute additional attacks and focus their attention on Syria. Hussein believed that other countries in the Arabian Peninsula were also in danger. Al-Qaeda expected a steady growth among their ranks and territories due to the declining power of the regimes in the Arabian Peninsula. The main focus of attack in this phase was supposed to be on oil suppliers and cyberterrorism, targeting the US economy and military infrastructure. The declaration of an Islamic Caliphate, which was projected between 2013 and 2016. In this phase, al-Qaeda expected the resistance from Israel to be heavily reduced. The declaration of an "Islamic Army" and a "fight between believers and non-believers", also called "total confrontation". "Definitive Victory", projected to be completed by 2020. According to the seven-phase strategy, the war is projected to last less than two years. According to Charles Lister of the Middle East Institute and Katherine Zimmerman of the American Enterprise Institute, the new model of al-Qaeda is to "socialize communities" and build a broad territorial base of operations with the support of local communities, also gaining income independent of the funding of sheiks. The English name of the organization is a simplified transliteration of the Arabic noun al-qāʿidah (‏القاعدة‎), which means "the foundation" or "the base". The initial al- is the Arabic definite article "the", hence "the base". In Arabic, al-Qaeda has four syllables (/alˈqaː.ʕi.da/). However, since two of the Arabic consonants in the name are not phones found in the English language, the common naturalized English pronunciations include /ælˈkaɪdə/, /ælˈkeɪdə/ and /ˌælkɑːˈiːdə/. Al-Qaeda's name can also be transliterated as al-Qaida, al-Qa'ida, or el-Qaida. The name 'al-Qaeda' was established a long time ago by mere chance. The late Abu Ebeida El-Banashiri established the training camps for our mujahedeen against Russia's terrorism. We used to call the training camp al-Qaeda. The name stayed. It has been argued that two documents seized from the Sarajevo office of the Benevolence International Foundation prove that the name was not simply adopted by the mujahideen movement and that a group called al-Qaeda was established in August 1988. Both of these documents contain minutes of meetings held to establish a new military group, and contain the term "al-Qaeda". Former British Foreign Secretary Robin Cook wrote that the word al-Qaeda should be translated as "the database", because it originally referred to the computer file of the thousands of mujahideen militants who were recruited and trained with CIA help to defeat the Russians. In April 2002, the group assumed the name Qa'idat al-Jihad (قاعدة الجهاد qāʿidat al-jihād), which means "the base of Jihad". According to Diaa Rashwan, this was "apparently as a result of the merger of the overseas branch of Egypt's al-Jihad, which was led by Ayman al-Zawahiri, with the groups Bin Laden brought under his control after his return to Afghanistan in the mid-1990s." The radical Islamist movement developed during the Islamic revival and the rise of the Islamist movement after the Iranian revolution. Some have argued that the writings of Islamic author and thinker Sayyid Qutb, inspired the al-Qaeda organization. In the 1950s and 1960s, Qutb preached that because of the lack of sharia law, the Muslim world was no longer Muslim, and had reverted to the pre-Islamic ignorance known as jahiliyyah. To restore Islam, Qutb argued that a vanguard of righteous Muslims was needed in order to establish "true Islamic states", implement sharia, and rid the Muslim world of any non-Muslim influences. In Qutb's view, the enemies of Islam included "world Jewry", which "plotted conspiracies" and opposed Islam. Islam is different from any other religion; it's a way of life. We [Khalifa and bin Laden] were trying to understand what Islam has to say about how we eat, who we marry, how we talk. We read Sayyid Qutb. He was the one who most affected our generation. Qutb also influenced bin Laden's mentor, Ayman al-Zawahiri. Zawahiri's uncle and maternal family patriarch, Mafouz Azzam, was Qutb's student, protégé, personal lawyer, and an executor of his estate. Azzam was one of the last people to see Qutb alive before his execution. Zawahiri paid homage to Qutb in his work Knights under the Prophet's Banner. Qutb's argued that many Muslims were not true Muslims. Some Muslims, Qutb argued, were apostates. These alleged apostates included leaders of Muslim countries, since they failed to enforce sharia law. The Afghan jihad against the pro-Soviet government further developed the Salafist Jihadist movement which inspired Al-Qaeda. While the leadership's own theological platform is essentially Salafi, the organization's umbrella is sufficiently wide to encompass various schools of thought and political leanings. Al-Qaeda counts among its members and supporters people associated with Wahhabism, Shafi'ism, Malikism, and Hanafism. There are even some Al-Qaeda members whose beliefs and practices are directly at odds with Salafism, such as Yunis Khalis, one of the leaders of the Afghan mujahedin. He was a mystic who visited the tombs of saints and sought their blessings – practices inimical to bin Laden's Wahhabi-Salafi school of thought. The only exception to this pan-Islamic policy is Shi'ism. Al-Qaeda seems implacably opposed to it, as it holds Shi'ism to be heresy. In Iraq it has openly declared war on the Badr Brigades, who have fully cooperated with the US, and now considers even Shi'i civilians to be legitimate targets for acts of violence. The Guardian in 2009 described five distinct phases in the development of al-Qaeda: its beginnings in the late 1980s, a "wilderness" period in 1990–1996, its "heyday" in 1996–2001, a network period from 2001 to 2005, and a period of fragmentation from 2005 to 2009. 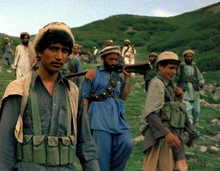 CIA-funded and ISI-trained Afghan mujahideen fighters crossing the Durand Line border to fight Soviet forces and the Soviet-backed Afghan government in 1985. The origins of al-Qaeda can be traced to the Soviet War in Afghanistan (December 1979 – February 1989). The United States viewed the conflict in Afghanistan in terms of the Cold War, with Marxists on one side and the native Afghan mujahideen on the other. This view led to a CIA program called Operation Cyclone, which channeled funds through Pakistan's Inter-Services Intelligence agency to the Afghan Mujahideen. The US government provided substantial financial support to the Afghan Islamic militants. Aid to Gulbuddin Hekmatyar, an Afghan mujahideen leader and founder of the Hezb-e Islami, amounted to more than $600 million. In addition to American aid, Hekmatyar was the recipient of Saudi aid. In the early 1990s, after the US had withdrawn support, Hekmatyar "worked closely" with bin Laden. At the same time, a growing number of Arab mujahideen joined the jihad against the Afghan Marxist regime, which was facilitated by international Muslim organizations, particularly the Maktab al-Khidamat (MAK). In 1984, MAK was established in Peshawar, Pakistan, by bin Laden and Abdullah Yusuf Azzam, a Palestinian Islamic scholar and member of the Muslim Brotherhood. MAK organized guest houses in Peshawar, near the Afghan border, and gathered supplies for the construction of paramilitary training camps to prepare foreign recruits for the Afghan war front. MAK was funded by the Saudi government as well as by individual Muslims including Saudi businessmen. [page needed] Bin Laden also became a major financier of the mujahideen, spending his own money and using his connections to influence public opinion about the war. From 1986, MAK began to set up a network of recruiting offices in the US, the hub of which was the Al Kifah Refugee Center at the Farouq Mosque on Brooklyn's Atlantic Avenue. Among notable figures at the Brooklyn center were "double agent" Ali Mohamed, whom FBI special agent Jack Cloonan called "bin Laden's first trainer", and "Blind Sheikh" Omar Abdel-Rahman, a leading recruiter of mujahideen for Afghanistan. Azzam and bin Laden began to establish camps in Afghanistan in 1987. MAK and foreign mujahideen volunteers, or "Afghan Arabs", did not play a major role in the war. While over 250,000 Afghan mujahideen fought the Soviets and the communist Afghan government, it is estimated that were never more than 2,000 foreign mujahideen on the field at any one time. Nonetheless, foreign mujahideen volunteers came from 43 countries, and the total number that participated in the Afghan movement between 1982 and 1992 is reported to have been 35,000. Bin Laden played a central role in organizing training camps for the foreign Muslim volunteers. The Soviet Union withdrew from Afghanistan in 1989. Mohammad Najibullah's Communist Afghan government lasted for three more years, before it was overrun by elements of the mujahideen. Toward the end of the Soviet military mission in Afghanistan, some foreign mujahideen wanted to expand their operations to include Islamist struggles in other parts of the world, such as Palestine and Kashmir. A number of overlapping and interrelated organizations were formed, to further those aspirations. One of these was the organization that would eventually be called al-Qaeda. Research suggests that al-Qaeda was formed on August 11, 1988, when a meeting between leaders of Egyptian Islamic Jihad, Abdullah Azzam, and bin Laden took place. An agreement was reached to link bin Laden's money with the expertise of the Islamic Jihad organization and take up the jihadist cause elsewhere after the Soviets withdrew from Afghanistan. Notes indicate al-Qaeda was a formal group by August 20, 1988. A list of requirements for membership itemized the following: listening ability, good manners, obedience, and making a pledge (bayat ) to follow one's superiors. In his memoir, bin Laden's former bodyguard, Nasser al-Bahri, gives the only publicly available description of the ritual of giving bayat when he swore his allegiance to the al-Qaeda chief. According to Wright, the group's real name wasn't used in public pronouncements because "its existence was still a closely held secret." 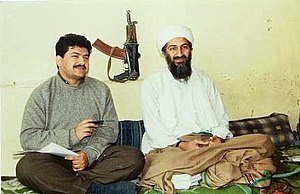 After Azzam was assassinated in 1989 and MAK broke up, significant numbers of MAK followers joined bin Laden's new organization. In November 1989, Ali Mohamed, a former special forces sergeant stationed at Fort Bragg, North Carolina, left military service and moved to California. He traveled to Afghanistan and Pakistan and became "deeply involved with bin Laden's plans." In 1991, Ali Mohammed is said to have helped orchestrate bin Laden's relocation to Sudan. Following the Soviet Union's withdrawal from Afghanistan in February 1989, bin Laden returned to Saudi Arabia. The Iraqi invasion of Kuwait in August 1990 had put the Kingdom and its ruling House of Saud at risk. The world's most valuable oil fields were within striking distance of Iraqi forces in Kuwait, and Saddam's call to pan-Arab/Islamism could potentially rally internal dissent. In the face of a seemingly massive Iraqi military presence, Saudi Arabia's own forces were outnumbered. Bin Laden offered the services of his mujahideen to King Fahd to protect Saudi Arabia from the Iraqi army. The Saudi monarch refused bin Laden's offer, opting instead to allow US and allied forces to deploy troops into Saudi territory. From around 1992 to 1996, al-Qaeda and bin Laden based themselves in Sudan at the invitation of Islamist theoretician Hassan al-Turabi. The move followed an Islamist coup d'état in Sudan, led by Colonel Omar al-Bashir, who professed a commitment to reordering Muslim political values. During this time, bin Laden assisted the Sudanese government, bought or set up various business enterprises, and established training camps. A key turning point for bin Laden occurred in 1993 when Saudi Arabia gave support for the Oslo Accords, which set a path for peace between Israel and Palestinians. Due to bin Laden's continuous verbal assault on King Fahd of Saudi Arabia, Fahd sent an emissary to Sudan on March 5, 1994 demanding bin Laden's passport. Bin Laden's Saudi citizenship was also revoked. His family was persuaded to cut off his stipend, $7 million a year, and his Saudi assets were frozen. His family publicly disowned him. There is controversy as to what extent bin Laden continued to garner support from members afterwards. In 1993, a young schoolgirl was killed in an unsuccessful attempt on the life of the Egyptian prime minister, Atef Sedki. Egyptian public opinion turned against Islamist bombings, and the police arrested 280 of al-Jihad's members and executed 6. In June 1995, an attempt to assassinate Egyptian president Mubarak led to the expulsion of Egyptian Islamic Jihad (EIJ), and in May 1996, of bin Laden from Sudan. According to Pakistani-American businessman Mansoor Ijaz, the Sudanese government offered the Clinton Administration numerous opportunities to arrest bin Laden. Ijaz's claims appeared in numerous op-ed pieces, including one in the Los Angeles Times and one in The Washington Post co-written with former Ambassador to Sudan Timothy M. Carney. Similar allegations have been made by Vanity Fair contributing editor David Rose, and Richard Miniter, author of Losing bin Laden, in a November 2003 interview with World. Sudan's minister of defense, Fatih Erwa, has claimed that Sudan offered to hand Bin Ladin over to the US. The Commission has found no credible evidence that this was so. Ambassador Carney had instructions only to push the Sudanese to expel Bin Ladin. Ambassador Carney had no legal basis to ask for more from the Sudanese since, at the time, there was no indictment out-standing. After the fall of the Afghan communist regime in 1992, Afghanistan was effectively ungoverned for four years and plagued by constant infighting between various mujahideen groups. This situation allowed the Taliban to organize. The Taliban also garnered support from graduates of Islamic schools, which are called madrassa. According to Ahmed Rashid, five leaders of the Taliban were graduates of Darul Uloom Haqqania, a madrassa in the small town of Akora Khattak. The town is situated near Peshawar in Pakistan, but the school is largely attended by Afghan refugees. This institution reflected Salafi beliefs in its teachings, and much of its funding came from private donations from wealthy Arabs. Four of the Taliban's leaders attended a similarly funded and influenced madrassa in Kandahar. Bin Laden's contacts were laundering donations to these schools, and Islamic banks were used to transfer money to an "array" of charities which served as front groups for al-Qaeda. Many of the mujahideen who later joined the Taliban fought alongside Afghan warlord Mohammad Nabi Mohammadi's Harkat i Inqilabi group at the time of the Russian invasion. This group also enjoyed the loyalty of most Afghan Arab fighters. The continuing lawlessness enabled the growing and well-disciplined Taliban to expand their control over territory in Afghanistan, and it came to establish an enclave which it called the Islamic Emirate of Afghanistan. In 1994, it captured the regional center of Kandahar, and after making rapid territorial gains thereafter, the Taliban captured the capital city Kabul in September 1996. In 1996, Taliban-controlled Afghanistan provided a perfect staging ground for al-Qaeda. While not officially working together, Al-Qaeda enjoyed the Taliban's protection and supported the regime in such a strong symbiotic relationship that many Western observers dubbed the Taliban's Islamic Emirate of Afghanistan as, "the world's first terrorist-sponsored state." However, at this time, only Pakistan, Saudi Arabia, and the United Arab Emirates recognized the Taliban as the legitimate government of Afghanistan. While in Afghanistan, the Taliban government tasked al-Qaeda with the training of Brigade 055, an elite element of the Taliban's army. The Brigade mostly consisted of foreign fighters, veterans from the Soviet Invasion, and adherents to the ideology of the mujahideen. In November 2001, as Operation Enduring Freedom had toppled the Taliban government, many Brigade 055 fighters were captured or killed, and those that survived were thought to have escaped into Pakistan along with bin Laden. By the end of 2008, some sources reported that the Taliban had severed any remaining ties with al-Qaeda, however, there is reason to doubt this. According to senior US military intelligence officials, there were fewer than 100 members of al-Qaeda remaining in Afghanistan in 2009. In 1994, the Salafi groups waging Salafi jihadism in Bosnia entered into decline, and groups such as the Egyptian Islamic Jihad began to drift away from the Salafi cause in Europe. Al-Qaeda stepped in and assumed control of around 80% of non-state armed cells in Bosnia in late 1995. At the same time, al-Qaeda ideologues instructed the network's recruiters to look for Jihadi international Muslims who believed that extremist-jihad must be fought on a global level. Al-Qaeda also sought to open the "offensive phase" of the global Salafi jihad. Bosnian Islamists in 2006 called for "solidarity with Islamic causes around the world", supporting the insurgents in Kashmir and Iraq as well as the groups fighting for a Palestinian state. In 1996, al-Qaeda announced its jihad to expel foreign troops and interests from what they considered Islamic lands. Bin Laden issued a fatwa, which amounted to a public declaration of war against the US and its allies, and began to refocus al-Qaeda's resources on large-scale, propagandist strikes. [T]he ruling to kill the Americans and their allies – civilians and military – is an individual duty for every Muslim who can do it in any country in which it is possible to do it, in order to liberate the al-Aqsa Mosque [in Jerusalem] and the holy mosque [in Mecca] from their grip, and in order for their armies to move out of all the lands of Islam, defeated and unable to threaten any Muslim. This is in accordance with the words of Almighty Allah, 'and fight the pagans all together as they fight you all together,' and 'fight them until there is no more tumult or oppression, and there prevail justice and faith in Allah'. Al-Qaeda has launched attacks against the Iraqi Shia majority in an attempt to incite sectarian violence. Al-Zarqawi purportedly declared an all-out war on Shiites while claiming responsibility for Shiite mosque bombings. The same month, a statement claiming to be from Al-Qaeda in Iraq was rejected as a "fake". In a December 2007 video, al-Zawahiri defended the Islamic State in Iraq, but distanced himself from the attacks against civilians, which he deemed to be perpetrated by "hypocrites and traitors existing among the ranks". US and Iraqi officials accused Al-Qaeda in Iraq of trying to slide Iraq into a full-scale civil war between Iraq's Shiite population and Sunni Arabs. This was done through an orchestrated campaign of civilian massacres and a number of provocative attacks against high-profile religious targets. With attacks including the 2003 Imam Ali Mosque bombing, the 2004 Day of Ashura and Karbala and Najaf bombings, the 2006 first al-Askari Mosque bombing in Samarra, the deadly single-day series of bombings in which at least 215 people were killed in Baghdad's Shiite district of Sadr City, and the second al-Askari bombing in 2007, Al-Qaeda in Iraq provoked Shiite militias to unleash a wave of retaliatory attacks, resulting in death squad-style killings and further sectarian violence which escalated in 2006. In 2008, sectarian bombings blamed on al-Qaeda in Iraq killed at least 42 people at the Imam Husayn Shrine in Karbala in March, and at least 51 people at a bus stop in Baghdad in June. In February 2014, after a prolonged dispute with al-Qaeda in Iraq's successor organisation, the Islamic State of Iraq and the Levant (ISIS), al-Qaeda publicly announced it was cutting all ties with the group, reportedly for its brutality and "notorious intractability". In Somalia, al-Qaeda agents had been collaborating closely with its Somali wing, which was created from the al-Shabaab group. In February 2012, al-Shabaab officially joined al-Qaeda, declaring loyalty in a video. Somalian al-Qaeda recruited children for suicide-bomber training, recruited young people to participate in militant actions against Americans. The percentage of attacks in the First World originating from the Afghanistan–Pakistan (AfPak) border declined starting in 2007, as al-Qaeda shifted to Somalia and Yemen. While al-Qaeda leaders were hiding in the tribal areas along the AfPak border, middle-tier leaders heightened activity in Somalia and Yemen. In January 2009, al-Qaeda's division in Saudi Arabia merged with its Yemeni wing to form al-Qaeda in the Arabian Peninsula (AQAP). Centered in Yemen, the group takes advantage of the country's poor economy, demography and domestic security. In August 2009, the group made an assassination attempt against a member of the Saudi royal family. President Obama asked Ali Abdullah Saleh to ensure closer cooperation with the US in the struggle against the growing activity of al-Qaeda in Yemen, and promised to send additional aid. The wars in Iraq and Afghanistan, drew US attention from Somalia and Yemen. In December 2011, US Secretary of Defense Leon Panetta said that the US operations against al-Qaeda "are now concentrating on key groups in Yemen, Somalia and North Africa." Al-Qaeda in the Arabian Peninsula claimed responsibility for the 2009 bombing attack on Northwest Airlines Flight 253 by Umar Farouk Abdulmutallab. The AQAP declared the Al-Qaeda Emirate in Yemen in March 31, 2011, after capturing the most of the Abyan Governorate. As the Saudi-led military intervention in Yemen escalated in July 2015, 50 civilians were killed, and 20 million were in need of aid. In February 2016, al-Qaeda forces and Saudi Arabian-led coalition forces were both seen fighting Houthi rebels in the same battle. In August 2018, Al Jazeera reported that "A military coalition battling Houthi rebels secured secret deals with al-Qaeda in Yemen and recruited hundreds of the group's fighters. ... Key figures in the deal-making said the United States was aware of the arrangements and held off on drone attacks against the armed group, which was created by Osama bin Laden in 1988." In December 1998, the Director of the CIA Counterterrorism Center reported to President Bill Clinton that al-Qaeda was preparing to launch attacks in the United States, and that the group was training personnel to hijack aircraft. On September 11, 2001, al-Qaeda attacked the United States, hijacking four airliners within the country and deliberately crashing two into the twin towers of the World Trade Center in New York City. The third plane crashed into the western side of the Pentagon in Arlington County, Virginia. The fourth plane was crashed into a field in Shanksville, Pennsylvania. In total, the attackers killed 2,977 victims and injured more than 6,000 others. US officials noted that Anwar al-Awlaki had considerable reach within the US. A former FBI agent identified Awlaki as a known "senior recruiter for al-Qaeda", and a spiritual motivator. 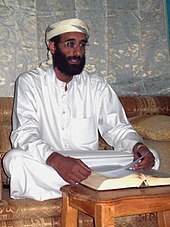 Awlaki's sermons in the US were attended by three of the 9/11 hijackers, and accused Fort Hood shooter Nidal Malik Hasan. US intelligence intercepted emails from Hasan to Awlaki between December 2008 and early 2009. On his website, Awlaki has praised Hasan's actions in the Fort Hood shooting. An unnamed official claimed there was good reason to believe Awlaki "has been involved in very serious terrorist activities since leaving the US [in 2002], including plotting attacks against America and our allies." US President Barack Obama approved the targeted killing of al-Awlaki by April 2010, making al-Awlaki the first US citizen ever placed on the CIA target list. That required the consent of the US National Security Council, and officials argued that the attack was appropriate because the individual posed an imminent danger to national security. In May 2010, Faisal Shahzad, who pleaded guilty to the 2010 Times Square car bombing attempt, told interrogators he was "inspired by" al-Awlaki, and sources said Shahzad had made contact with al-Awlaki over the Internet. Representative Jane Harman called him "terrorist number one", and Investor's Business Daily called him "the world's most dangerous man". In July 2010, the US Treasury Department added him to its list of Specially Designated Global Terrorists, and the UN added him to its list of individuals associated with al-Qaeda. In August 2010, al-Awlaki's father initiated a lawsuit against the US government with the American Civil Liberties Union, challenging its order to kill al-Awlaki. In October 2010, US and UK officials linked al-Awlaki to the 2010 cargo plane bomb plot. In September 2011, al-Awlaki was killed in a targeted killing drone attack in Yemen. On March 16, 2012, it was reported that Osama bin Laden plotted to kill US President Barack Obama. View of Osama bin Laden's compound in Abbottabad, Pakistan, where he was killed on May 1, 2011. On May 1, 2011, US President Barack Obama announced that Osama bin Laden had been killed by "a small team of Americans" acting under direct orders, in a covert operation in Abbottabad, Pakistan. The action took place 50 km (31 mi) north of Islamabad. 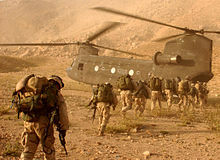 According to US officials, a team of 20–25 US Navy SEALs under the command of the Joint Special Operations Command stormed bin Laden's compound with two helicopters. Bin Laden and those with him were killed during a firefight in which US forces experienced no casualties. According to one US official the attack was carried out without the knowledge or consent of the Pakistani authorities. In Pakistan some people were reported to be shocked at the unauthorized incursion by US armed forces. The site is a few miles from the Pakistan Military Academy in Kakul. In his broadcast announcement President Obama said that US forces "took care to avoid civilian casualties." Details soon emerged that three men and a woman were killed along with bin Laden, the woman being killed when she was "used as a shield by a male combatant". DNA from bin Laden's body, compared with DNA samples on record from his dead sister, confirmed bin Laden's identity. The body was recovered by the US military and was in its custody until, according to one US official, his body was buried at sea according to Islamic traditions. One US official stated that "finding a country willing to accept the remains of the world's most wanted terrorist would have been difficult." US State Department issued a "Worldwide caution" for Americans following bin Laden's death and US diplomatic facilities everywhere were placed on high alert, a senior US official said. Crowds gathered outside the White House and in New York City's Times Square to celebrate bin Laden's death. The scene of an October 2012 Aleppo bombings, for which al-Nusra Front claimed responsibility. In 2003, President Bashar al-Assad revealed in an interview with a Kuwaiti newspaper that he doubted that al-Qaeda even existed. He was quoted as saying, "Is there really an entity called al-Qaeda? Was it in Afghanistan? Does it exist now?" He went on further to remark about bin Laden, commenting "[he] cannot talk on the phone or use the Internet, but he can direct communications to the four corners of the world? This is illogical." Following the mass protests that took place in 2011, which demanded the resignation of al-Assad, al-Qaeda affiliated groups and Sunni sympathizers soon began to constitute an effective fighting force against al-Assad. Before the Syrian Civil War, al-Qaeda's presence in Syria was negligible, but its growth thereafter was rapid. Groups such as the al-Nusra Front and the Islamic State of Iraq and the Levant have recruited many foreign Mujahideen to train and fight in what has gradually become a highly sectarian war. Ideologically, the Syrian Civil War has served the interests of al-Qaeda as it pits a mainly Sunni opposition against a Shia government. Al-Qaeda and other fundamentalist Sunni militant groups have invested heavily in the civil conflict, actively backing and supporting the Syrian Opposition. 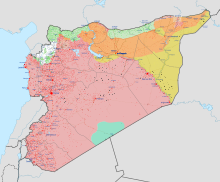 On February 2, 2014, al-Qaeda distanced itself from ISIS and its actions in Syria, however during 2014–15, ISIS and the al-Qaeda-linked al-Nusra Front were still able to occasionally cooperate in their fight against the Syrian government. Al-Nusra (backed by Saudi Arabia and Turkey as part of the Army of Conquest during 2015–2017) launched many attacks and bombings, mostly against targets affiliated with or supportive of the Syrian government. From October 2015, Russian air strikes targeted positions held by al-Nusra Front, as well as other Islamist and non-Islamist rebels, while the US also targeted al-Nusra with airstrikes. In early 2016, a leading ISIL ideologue described al-Qaeda as the "Jews of jihad". In September 2014 al-Zawahiri announced al-Qaeda was establishing a front in India to "wage jihad against its enemies, to liberate its land, to restore its sovereignty, and to revive its Caliphate." Al-Zawahiri nominated India as a beachhead for regional jihad taking in neighboring countries such as Myanmar and Bangladesh. The motivation for the video was questioned, as it appeared the militant group was struggling to remain relevant in light of the emerging prominence of ISIS. The new wing was to be known as "Qaedat al-Jihad fi'shibhi al-qarrat al-Hindiya" or al-Qaida in the Indian Subcontinent (AQIS). Leaders of several Indian Muslim organizations rejected al-Zawahiri's pronouncement, saying they could see no good coming from it, and viewed it as a threat to Muslim youth in the country. In 2014 Zee News reported that Bruce Riede (a former CIA analyst and National Security Council official for South Asia) accused the Pakistan military intelligence—Inter-Services Intelligence (ISI)—of organising and assisting Al-Qaeda to organise in India, that Pakistan ought to be warned that it will be placed on the list of State Sponsors of Terrorism, and wrote that "Zawahiri made the tape in his hideout in Pakistan, no doubt, and many Indians suspect the ISI is helping to protect him". Al-Qaeda has carried out a total of six major attacks, four of them in its jihad against America. In each case the leadership planned the attack years in advance, arranging for the shipment of weapons and explosives and using its businesses to provide operatives with safehouses and false identities. On December 29, 1992, al-Qaeda's launched its first attack. Two bombs were detonated in Aden, Yemen. The first target was the Movenpick Hotel and the second was the parking lot of the Goldmohur Hotel. In 1996, bin Laden personally engineered a plot to assassinate United States President Bill Clinton while the president was in Manila for the Asia-Pacific Economic Cooperation. However, intelligence agents intercepted a message before the motorcade was to leave, and alerted the US Secret Service. Agents later discovered a bomb planted under a bridge. 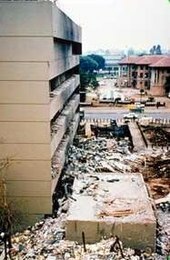 On August 7, 1998, al-Qaeda bombed the US embassies in East Africa, killing 224 people, including 12 Americans. In retaliation, a barrage of cruise missiles launched by the US military devastated an al-Qaeda base in Khost, Afghanistan. The network's capacity was unharmed. In late 1999 and 2000, Al-Qaeda planned attacks to coincide with the millennium, masterminded by Abu Zubaydah and involving Abu Qatada, which would include the bombing of Christian holy sites in Jordan, the bombing of Los Angeles International Airport by Ahmed Ressam, and the bombing of the USS The Sullivans (DDG-68). 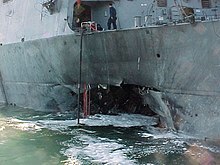 On October 12, 2000, al-Qaeda militants in Yemen bombed the missile destroyer USS Cole in a suicide attack, killing 17 US servicemen and damaging the vessel while it lay offshore. Inspired by the success of such a brazen attack, al-Qaeda's command core began to prepare for an attack on the US itself. The September 11 attacks on America by al-Qaeda killed 2,977 people — 2,507 civilians, 343 firefighters, 72 law enforcement officers, and 55 military personnel. Two commercial airliners were deliberately flown into the twin towers of the World Trade Center, a third into the Pentagon, and a fourth, originally intended to target either the United States Capitol or the White House, crashed in a field in Stonycreek Township near Shanksville, Pennsylvania. It was also the deadliest foreign attack on American soil since the Japanese attack on Pearl Harbor on December 7, 1941. The attacks were conducted by al-Qaeda, acting in accord with the 1998 fatwa issued against the US and its allies by persons under the command of bin Laden, al-Zawahiri, and others. Evidence points to suicide squads led by al-Qaeda military commander Mohamed Atta as the culprits of the attacks, with bin Laden, Ayman al-Zawahiri, Khalid Sheikh Mohammed, and Hambali as the key planners and part of the political and military command. Messages issued by bin Laden after September 11, 2001, praised the attacks, and explained their motivation while denying any involvement. Bin Laden legitimized the attacks by identifying grievances felt by both mainstream and Islamist Muslims, such as the general perception that the US was actively oppressing Muslims. Bin Laden asserted that America was massacring Muslims in "Palestine, Chechnya, Kashmir and Iraq" and that Muslims should retain the "right to attack in reprisal." He also claimed the 9/11 attacks were not targeted at people, but "America's icons of military and economic power," despite the fact he planned to attack in the morning when most of the people in the intended targets were present and thus generating the maximum number of human casualties. Evidence has since come to light that the original targets for the attack may have been nuclear power stations on the U.S. East Coast. The targets were later altered by al-Qaeda, as it was feared that such an attack "might get out of hand". In the immediate aftermath of the 9/11 attacks, the US government responded, and began to prepare its armed forces to overthrow the Taliban, which it believed was harboring al-Qaeda. The US offered Taliban leader Mullah Omar a chance to surrender bin Laden and his top associates. The first forces to be inserted into Afghanistan were paramilitary officers from the CIA's elite Special Activities Division (SAD). The Taliban offered to turn over bin Laden to a neutral country for trial if the US would provide evidence of bin Laden's complicity in the attacks. US President George W. Bush responded by saying: "We know he's guilty. Turn him over", and British Prime Minister Tony Blair warned the Taliban regime: "Surrender bin Laden, or surrender power". Soon thereafter the US and its allies invaded Afghanistan, and together with the Afghan Northern Alliance removed the Taliban government as part of the war in Afghanistan. As a result of the US special forces and air support for the Northern Alliance ground forces, a number of Taliban and al-Qaeda training camps were destroyed, and much of the operating structure of al-Qaeda is believed to have been disrupted. After being driven from their key positions in the Tora Bora area of Afghanistan, many al-Qaeda fighters tried to regroup in the rugged Gardez region of the nation. By early 2002, al-Qaeda had been dealt a serious blow to its operational capacity, and the Afghan invasion appeared to be a success. Nevertheless, a significant Taliban insurgency remained in Afghanistan. Debate continued regarding the nature of al-Qaeda's role in the 9/11 attacks. The US State Department released a videotape showing bin Laden speaking with a small group of associates somewhere in Afghanistan shortly before the Taliban was removed from power. Although its authenticity has been questioned by a couple of people, the tape definitively implicates bin Laden and al-Qaeda in the September 11 attacks. The tape was aired on many television channels, with an accompanying English translation provided by the US Defense Department. In September 2004, the 9/11 Commission officially concluded that the attacks were conceived and implemented by al-Qaeda operatives. In October 2004, bin Laden appeared to claim responsibility for the attacks in a videotape released through Al Jazeera, saying he was inspired by Israeli attacks on high-rises in the 1982 invasion of Lebanon: "As I looked at those demolished towers in Lebanon, it entered my mind that we should punish the oppressor in kind and that we should destroy towers in America in order that they taste some of what we tasted and so that they be deterred from killing our women and children." By the end of 2004, the US government proclaimed that two-thirds of the most senior al-Qaeda figures from 2001 had been captured and interrogated by the CIA: Abu Zubaydah, Ramzi bin al-Shibh and Abd al-Rahim al-Nashiri in 2002; Khalid Sheikh Mohammed in 2003; and Saif al Islam el Masry in 2004. Mohammed Atef and several others were killed. The West was criticized for not being able to handle Al-Qaida despite a decade of the war. Front page of The Guardian Weekly on the eighth anniversary of the September 11 attacks. The article claimed that al-Qaeda's activity is "increasingly dispersed to 'affiliates' or 'franchises' in Yemen and North Africa." Al-Qaeda involvement in Africa has included a number of bombing attacks in North Africa, while supporting parties in civil wars in Eritrea and Somalia. From 1991 to 1996, bin Laden and other al-Qaeda leaders were based in Sudan. Islamist rebels in the Sahara calling themselves al-Qaeda in the Islamic Maghreb have stepped up their violence in recent years. French officials say the rebels have no real links to the al-Qaeda leadership, but this has been disputed. It seems likely that bin Laden approved the group's name in late 2006, and the rebels "took on the al Qaeda franchise label", almost a year before the violence began to escalate. Following the Libyan Civil War, the removal of Gaddafi and the ensuing period of post-civil war violence in Libya, various Islamist militant groups affiliated with al-Qaeda were able to expand their operations in the region. The 2012 Benghazi attack, which resulted in the death of US Ambassador J. Christopher Stevens and three other Americans, is suspected of having been carried out by various Jihadist networks, such as Al-Qaeda in the Islamic Maghreb, Ansar al-Sharia and several other Al-Qaeda affiliated groups. The capture of Nazih Abdul-Hamed al-Ruqai, a senior al-Qaeda operative wanted by the United States for his involvement in the 1998 United States embassy bombings, on October 5, 2013, by US Navy Seals, FBI and CIA agents illustrates the importance the US and other Western allies have placed on North Africa. Prior to the September 11 attacks, al-Qaeda was present in Bosnia and Herzegovina, and its members were mostly veterans of the El Mudžahid detachment of the Bosnian Muslim Army of the Republic of Bosnia and Herzegovina. Three al-Qaeda operatives carried out the Mostar car bombing in 1997. The operatives were closely linked to and financed by the Saudi High Commission for Relief of Bosnia and Herzegovina founded by then-prince King Salman of Saudi Arabia. Before the 9/11 attacks and the US invasion of Afghanistan, westerners who had been recruits at al-Qaeda training camps were sought after by al-Qaeda's military wing. Language skills and knowledge of Western culture were generally found among recruits from Europe, such was the case with Mohamed Atta, an Egyptian national studying in Germany at the time of his training, and other members of the Hamburg Cell. Osama bin Laden and Mohammed Atef would later designate Atta as the ringleader of the 9/11 hijackers. Following the attacks, Western intelligence agencies determined that al-Qaeda cells operating in Europe had aided the hijackers with financing and communications with the central leadership based in Afghanistan. In 2009, three Londoners, Tanvir Hussain, Assad Sarwar and Ahmed Abdullah Ali, were convicted of conspiring to detonate bombs disguised as soft drinks on seven airplanes bound for Canada and the US The MI5 investigation regarding the plot involved more than a year of surveillance work conducted by over two hundred officers. British and US officials said the plot – unlike many similar homegrown European Islamic militant plots – was directly linked to al-Qaeda and guided by senior al-Qaeda members in Pakistan. Following Yemeni unification in 1990, Wahhabi networks began moving missionaries into the country. Although it is unlikely that bin Laden or Saudi al-Qaeda were directly involved, the personal connections they made would be established over the next decade and used in the USS Cole bombing. Concerns grew over Al Qaeda's group in Yemen. In Iraq, al-Qaeda forces loosely associated with the leadership were embedded in the Jama'at al-Tawhid wal-Jihad group commanded by Abu Musab al-Zarqawi. Specializing in suicide operations, they have been a "key driver" of the Sunni insurgency. Although they played a small part in the overall insurgency, between 30% and 42% of all suicide bombings which took place in the early years were claimed by Zarqawi's group. Reports have indicated that oversights such as the failure to control access to the Qa'qaa munitions factory in Yusufiyah have allowed large quantities of munitions to fall into the hands of al-Qaida. In November 2010, the militant group Islamic State of Iraq, which is linked to al-Qaeda in Iraq, threatened to "exterminate all Iraqi Christians". Al-Qaeda did not begin training Palestinians until the late 1990s. Large groups such as Hamas and Palestinian Islamic Jihad have rejected an alliance with al-Qaeda, fearing that al-Qaeda will co-opt their cells. This may have changed recently. The Israeli security and intelligence services believe that al-Qaeda has managed to infiltrate operatives from the Occupied Territories into Israel, and is waiting for an opportunity to attack. As of 2015[update], Saudi Arabia, Qatar and Turkey are openly supporting the Army of Conquest, an umbrella rebel group fighting in the Syrian Civil War against the Syrian government that reportedly includes an al-Qaeda linked al-Nusra Front and another Salafi coalition known as Ahrar al-Sham. Bin Laden and Ayman al-Zawahiri consider India to be a part of an alleged Crusader-Zionist-Hindu conspiracy against the Islamic world. According to a 2005 report by the Congressional Research Service, bin Laden was involved in training militants for Jihad in Kashmir while living in Sudan in the early 1990s. By 2001, Kashmiri militant group Harkat-ul-Mujahideen had become a part of the al-Qaeda coalition. According to the United Nations High Commissioner for Refugees (UNHCR), al-Qaeda was thought to have established bases in Pakistan administered Kashmir (in Azad Kashmir, and to some extent in Gilgit–Baltistan) during the 1999 Kargil War and continued to operate there with tacit approval of Pakistan's Intelligence services. Many of the militants active in Kashmir were trained in the same madrasahs as Taliban and al-Qaeda. Fazlur Rehman Khalil of Kashmiri militant group Harkat-ul-Mujahideen was a signatory of al-Qaeda's 1998 declaration of Jihad against America and its allies. In a 'Letter to American People' (2002), bin Laden wrote that one of the reasons he was fighting America was because of its support to India on the Kashmir issue. In November 2001, Kathmandu airport went on high alert after threats that bin Laden planned to hijack a plane and crash it into a target in New Delhi. In 2002, US Secretary of Defense Donald Rumsfeld, on a trip to Delhi, suggested that al-Qaeda was active in Kashmir though he did not have any evidence. Rumsfeld proposed hi-tech ground sensors along the Line of Control to prevent militants from infiltrating into Indian-administered Kashmir. An investigation in 2002 found evidence that al-Qaeda and its affiliates were prospering in Pakistan-administered Kashmir with tacit approval of Pakistan's Inter-Services Intelligence. In 2002, a special team of Special Air Service and Delta Force was sent into Indian-Administered Kashmir to hunt for bin Laden after receiving reports that he was being sheltered by Kashmiri militant group Harkat-ul-Mujahideen, which had been responsible for kidnapping western tourists in Kashmir in 1995. Britain's highest-ranking al-Qaeda operative Rangzieb Ahmed had previously fought in Kashmir with the group Harkat-ul-Mujahideen and spent time in Indian prison after being captured in Kashmir. US officials believe that al-Qaeda was helping organize attacks in Kashmir in order to provoke conflict between India and Pakistan. Their strategy was to force Pakistan to move its troops to the border with India, thereby relieving pressure on al-Qaeda elements hiding in northwestern Pakistan. In 2006 al-Qaeda claimed they had established a wing in Kashmir. However Indian Army General H.S. Panag argued that the army had ruled out the presence of al-Qaeda in Indian-administered Jammu and Kashmir. Panag also stated that al-Qaeda had strong ties with Kashmiri militant groups Lashkar-e-Taiba and Jaish-e-Mohammed based in Pakistan. It has been noted that Waziristan has become a battlefield for Kashmiri militants fighting NATO in support of al-Qaeda and Taliban. Dhiren Barot, who wrote the Army of Madinah in Kashmir and was an al-Qaeda operative convicted for involvement in the 2004 financial buildings plot, had received training in weapons and explosives at a militant training camp in Kashmir. Maulana Masood Azhar, the founder of Kashmiri group Jaish-e-Mohammed, is believed to have met bin Laden several times and received funding from him. In 2002, Jaish-e-Mohammed organized the kidnapping and murder of Daniel Pearl in an operation run in conjunction with al-Qaeda and funded by bin Laden. According to American counter-terrorism expert Bruce Riedel, al-Qaeda and Taliban were closely involved in the 1999 hijacking of Indian Airlines Flight 814 to Kandahar which led to the release of Maulana Masood Azhar and Ahmed Omar Saeed Sheikh from an Indian prison. This hijacking, Riedel stated, was rightly described by then Indian Foreign Minister Jaswant Singh as a 'dress rehearsal' for September 11 attacks. Bin Laden personally welcomed Azhar and threw a lavish party in his honor after his release. Ahmed Omar Saeed Sheikh, who had been in prison for his role in the 1994 kidnappings of Western tourists in India, went on to murder Daniel Pearl and was sentenced to death in Pakistan. Al-Qaeda operative Rashid Rauf, who was one of the accused in 2006 transatlantic aircraft plot, was related to Maulana Masood Azhar by marriage. Lashkar-e-Taiba, a Kashmiri militant group which is thought to be behind 2008 Mumbai attacks, is also known to have strong ties to senior al-Qaeda leaders living in Pakistan. In Late 2002, top al-Qaeda operative Abu Zubaydah was arrested while being sheltered by Lashkar-e-Taiba in a safe house in Faisalabad. The FBI believes that al-Qaeda and Lashkar have been 'intertwined' for a long time while the CIA has said that al-Qaeda funds Lashkar-e-Taiba. Jean-Louis Bruguière told Reuters in 2009 that "Lashkar-e-Taiba is no longer a Pakistani movement with only a Kashmir political or military agenda. Lashkar-e-Taiba is a member of al-Qaeda." In a video released in 2008, American-born senior al-Qaeda operative Adam Yahiye Gadahn stated that "victory in Kashmir has been delayed for years; it is the liberation of the jihad there from this interference which, Allah willing, will be the first step towards victory over the Hindu occupiers of that Islam land." In September 2009, a US drone strike reportedly killed Ilyas Kashmiri who was the chief of Harkat-ul-Jihad al-Islami, a Kashmiri militant group associated with al-Qaeda. Kashmiri was described by Bruce Riedel as a 'prominent' al-Qaeda member while others have described him as head of military operations for al-Qaeda. Kashmiri was also charged by the US in a plot against Jyllands-Posten, the Danish newspaper which was at the center of Jyllands-Posten Muhammad cartoons controversy. US officials also believe that Kashmiri was involved in the Camp Chapman attack against the CIA. In January 2010, Indian authorities notified Britain of an al-Qaeda plot to hijack an Indian airlines or Air India plane and crash it into a British city. This information was uncovered from interrogation of Amjad Khwaja, an operative of Harkat-ul-Jihad al-Islami, who had been arrested in India. Al-Qaeda and its successors have migrated online to escape detection in an atmosphere of increased international vigilance. The group's use of the Internet has grown more sophisticated, with online activities that include financing, recruitment, networking, mobilization, publicity, and information dissemination, gathering and sharing. Abu Ayyub al-Masri's al-Qaeda movement in Iraq regularly releases short videos glorifying the activity of jihadist suicide bombers. In addition, both before and after the death of Abu Musab al-Zarqawi (the former leader of al-Qaeda in Iraq), the umbrella organization to which al-Qaeda in Iraq belongs, the Mujahideen Shura Council, has a regular presence on the Web. The range of multimedia content includes guerrilla training clips, stills of victims about to be murdered, testimonials of suicide bombers, and videos that show participation in jihad through stylized portraits of mosques and musical scores. A website associated with al-Qaeda posted a video of captured American entrepreneur Nick Berg being decapitated in Iraq. Other decapitation videos and pictures, including those of Paul Johnson, Kim Sun-il, and Daniel Pearl, were first posted on jihadist websites. In December 2004 an audio message claiming to be from bin Laden was posted directly to a website, rather than sending a copy to al Jazeera as he had done in the past. Al-Qaeda turned to the Internet for release of its videos in order to be certain they would be available unedited, rather than risk the possibility of al Jazeera editing out anything critical of the Saudi royal family. Alneda.com and Jehad.net were perhaps the most significant al-Qaeda websites. Alneda was initially taken down by American Jon Messner, but the operators resisted by shifting the site to various servers and strategically shifting content. The US government charged a British information technology specialist, Babar Ahmad, with terrorist offences related to his operating a network of English-language al-Qaeda websites, such as Azzam.com. He was convicted and sentenced to 12-and-a-half years in prison. Al-Qaeda is believed to be operating a clandestine aviation network including "several Boeing 727 aircraft", turboprops and executive jets, according to a 2010 Reuters story. Based on a US Department of Homeland Security report, the story said that al-Qaeda is possibly using aircraft to transport drugs and weapons from South America to various unstable countries in West Africa. A Boeing 727 can carry up to 10 tons of cargo. The drugs eventually are smuggled to Europe for distribution and sale, and the weapons are used in conflicts in Africa and possibly elsewhere. Gunmen with links to al-Qaeda have been increasingly kidnapping Europeans for ransom. The profits from the drug and weapon sales, and kidnappings can, in turn, fund more militant activities. Experts debate the notion al-Qaeda attacks were an indirect result from the American CIA's Operation Cyclone program to help the Afghan mujahideen. Robin Cook, British Foreign Secretary from 1997 to 2001, has written that al-Qaeda and bin Laden were "a product of a monumental miscalculation by western security agencies", and that "Al-Qaida, literally 'the database', was originally the computer file of the thousands of mujahideen who were recruited and trained with help from the CIA to defeat the Russians." A variety of sources, including CNN journalist Peter Bergen, Pakistani ISI Brigadier Mohammad Yousaf, and CIA operatives involved in the Afghan program, such as Vincent Cannistraro, deny that the CIA or other American officials had contact with the foreign mujahideen or bin Laden, let alone armed, trained, coached or indoctrinated them. Bergen and others argue that there was no need to recruit foreigners unfamiliar with the local language, customs or lay of the land since there were a quarter of a million local Afghans willing to fight. Bergen further argues that foreign mujahideen had no need for American funds since they received several million dollars per year from internal sources. Lastly, he argues that Americans could not have trained the mujahideen because Pakistani officials would not allow more than a handful of them to operate in Pakistan and none in Afghanistan, and that the Afghan Arabs were almost invariably militant Islamists reflexively hostile to Westerners whether or not the Westerners were helping the Muslim Afghans. According to Bergen, who conducted the first television interview with bin Laden in 1997: the idea that "the CIA funded bin Laden or trained bin Laden... [is] a folk myth. There's no evidence of this... Bin Laden had his own money, he was anti-American and he was operating secretly and independently... The real story here is the CIA didn't really have a clue about who this guy was until 1996 when they set up a unit to really start tracking him." Some of the $500 million the CIA poured into Afghanistan reached [Al-Zawahiri's] group. Al-Zawahiri has become a close aide of bin Laden... Bin Laden was only loosely connected with the [Hezb-i-Islami faction of the mujahideen led by Gulbuddin Hekmatyar], serving under another Hezb-i-Islami commander known as Engineer Machmud. However, bin Laden's Office of Services, set up to recruit overseas for the war, received some US cash. CNN report has revealed that Saudi Arabia and the United Arab Emirates (UAE) have been handing out sophisticated American-made weapons to al-Qaeda-linked fighters in Yemen. In the year 2000, British intelligence reported that the Pakistani ISI took an important role in several Al-Qaeda training camps from the 1990s onwards. Islamic extremism dates back to the Kharijites of the 7th century. From their essentially political position, the Kharijites developed extreme doctrines that set them apart from both mainstream Sunni and Shiʿa Muslims. The Kharijites were particularly noted for adopting a radical approach to Takfir, whereby they declared other Muslims to be unbelievers and therefore deemed them worthy of death. According to a number of sources, a "wave of revulsion" has been expressed against al-Qaeda and its affiliates by "religious scholars, former fighters and militants" who are alarmed by al-Qaeda's takfir and its killing of Muslims in Muslim countries, especially in Iraq. Noman Benotman, a former Afghan Arab and a militant member of the Libyan Islamic Fighting Group (LIFG), went public with an open letter of criticism to Ayman al-Zawahiri in November 2007, after persuading the imprisoned senior leaders of his former group to enter into peace negotiations with the Libyan regime. While Ayman al-Zawahiri announced the affiliation of the group with al-Qaeda in November 2007, the Libyan government released 90 members of the group from prison several months after "they were said to have renounced violence." My brother Osama, how much blood has been spilt? How many innocent people, children, elderly, and women have been killed... in the name of al-Qaeda? Will you be happy to meet God Almighty carrying the burden of these hundreds of thousands or millions [of victims] on your back? According to Pew polls, support for al-Qaeda had dropped in the Muslim world in the years before 2008. Support of suicide bombings in Indonesia, Lebanon, and Bangladesh, dropped by half or more in the last five years.[when?] In Saudi Arabia, only 10 percent had a favorable view of al-Qaeda, according to a December 2017 poll by Terror Free Tomorrow, a Washington-based think tank. In 2007, the imprisoned Sayyed Imam Al-Sharif, an influential Afghan Arab, "ideological godfather of al-Qaeda", and former supporter of takfir, withdrew his support from al-Qaeda with a book Wathiqat Tarshid Al-'Aml Al-Jihadi fi Misr w'Al-'Alam (English: Rationalizing Jihad in Egypt and the World). Although once associated with al-Qaeda, in September 2009 LIFG completed a new "code" for jihad, a 417-page religious document entitled "Corrective Studies". Given its credibility and the fact that several other prominent Jihadists in the Middle East have turned against al-Qaeda, the LIFG's reversal may be an important step toward staunching al-Qaeda's recruitment. Bilal Abdul Kareem, an American journalist based in Syria created a documentary about al-Shabab, al-Qaeda's affiliate in Somalia. The documentary included interviews with former members of the group who stated their reasons for leaving al-Shabab. The members made accusations of segregation, lack of religious awareness and internal corruption and favoritism. In response to Kareem, the Global Islamic Media Front condemned Kareem, called him a liar, and denied the accusations from the former fighters. In mid-2014 after the Islamic State of Iraq and the Levant declared that they had restored the Caliphate, an audio statement was released by the then-spokesman of the group Abu Muhammad al-Adnani claiming that "the legality of all emirates, groups, states, and organizations, becomes null by the expansion of the Caliphate's authority". The speech included a religious refutation of Al-Qaeda for being too lenient regarding Shiites and their refusal to recognize the authority Abu Bakr al-Baghdadi, al-Adnani specifically noting: "It is not suitable for a state to give allegiance to an organization". He also recalled a past instance in which Osama bin Laden called on al-Qaeda members and supporters to give allegiance to Abu Omar al-Baghdadi when the group was still solely operating in Iraq, as the Islamic State of Iraq, and condemned Ayman al-Zawahiri for not making this same claim for Abu Bakr al-Baghdadi, and that Zawahiri was encouraging factionalism and division between former allies of ISIL such as the al-Nusra Front. ^ a b Moghadam, Assaf (2008). The Globalization of Martyrdom: Al Qaeda, Salafi Jihad, and the Diffusion of Suicide Attacks. Johns Hopkins University. p. 48. ISBN 978-0-8018-9055-0. ^ Livesey, Bruce (January 25, 2005). "Special Reports – The Salafist Movement: Al Qaeda's New Front". PBS Frontline. WGBH educational foundation. Retrieved October 18, 2011. Geltzer, Joshua A. (2011). US Counter-Terrorism Strategy and al-Qaeda: Signalling and the Terrorist World-View (Reprint ed.). Routledge. p. 83. ISBN 978-0415664523. ^ a b "The Future of Terrorism: What al-Qaida Really Wants". Der Spiegel. September 11, 2001. Archived from the original on March 7, 2012. Retrieved October 18, 2011. ^ "Al-Qaeda seeks global dominance". The Daily Telegraph. London. Archived from the original on January 12, 2012. "Jihadists Want Global Caliphate". ThePolitic.com. July 27, 2005. Archived from the original on September 30, 2011. Retrieved October 18, 2011. Pike, John. "Al-Qaida". Globalsecurity.org. Retrieved October 18, 2011. Burke, Jason (March 21, 2004). "What exactly does al-Qaeda want?". The Guardian. London. ^ a b c United States v. Usama bin Laden et al. , Cr. 1023, Testimony of Jamal Ahmed Mohamed al-Fadl (SDNY February 6, 2001). "Al-Qaeda's origins and links". BBC News. July 20, 2004. Retrieved June 3, 2014. Cooley, John K. (Spring 2003). Unholy Wars: Afghanistan, America and International Terrorism. ^ a b "Conversation With Terror". Time. January 1999. Retrieved March 22, 2015. ^ a b October 6, 2002. Appeared in Al-Qala'a website and then The Observer and The Guardian on November 24, 2002. ^ "frontline: the terrorist and the superpower: who is bin laden? : interview with osama bin laden (in may 1998)". pbs.org. Archived from the original on May 8, 1999. ^ "New ISIS and Al-Qaeda propaganda prioritize the US and Jews as targets". Anti-Defamation League. ^ "ISIS Augments Its Threats Against Israel". Anti-Defamation League. ^ Evan Centanni (May 31, 2013). 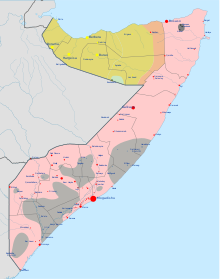 "War in Somalia: Map of Al Shabaab Control (June 2013)". Political Geography Now. Retrieved August 18, 2014. ^ "Prensa Latina News Agency". Retrieved April 12, 2016. ^ "Aden intelligence service building targeted". AFP. Gulf News. August 22, 2015. Retrieved August 22, 2015. ^ Bill Roggio (April 26, 2011). "How many al Qaeda operatives are now left in Afghanistan?". Longwarjournal.org. Retrieved April 10, 2014. ^ "Al Qaeda in Afghanistan Is Attempting A Comeback". The Huffington Post. October 21, 2012. Archived from the original on October 23, 2012. Retrieved April 10, 2014. ^ "Al-Qaeda map: Isis, Boko Haram and other affiliates' strongholds across Africa and Asia". June 12, 2014. Retrieved August 29, 2014. ^ a b c d Bruce Hoffman (March 6, 2018). "Al-Qaeda's Resurrection". Council on Foreign Relations. ^ "Al-Qaeda in the Islamic Maghreb (AQIM)". Council on Foreign Relations. March 27, 2015. Retrieved July 2, 2015. ^ "Profile: Al-Qaeda in North Africa". BBC. January 17, 2013. Retrieved July 2, 2015. ^ "Mali: qui sont les nouveaux chefs des katibas jihadistes?". Radio France internationale. May 14, 2014. Retrieved August 19, 2015. ^ "Notorious Extremist Said to Head Al-Qaida West Africa Branch". abc. August 15, 2015. Retrieved August 19, 2015. ^ "AP Investigation: US allies, al-Qaida battle rebels in Yemen". AP News. August 7, 2018. ^ "Jihadist groups across globe vying for terror spotlight". Fox News Channel. July 10, 2014. Retrieved January 7, 2015. ^ "Who are Somalia's al-Shabab?". December 22, 2017 – via www.bbc.com. ^ "Bombs are falling on a rebel enclave in Syria every minute". NBC News. February 21, 2018. ^ Reality Check team (September 7, 2018). "Syria: Who's in control of Idlib?". BBC News. Retrieved October 22, 2018. ^ Kyle Orton (March 1, 2018). "A New Branch of Al-Qaeda Emerges in Syria". Kyle Orton's Blog. ^ ""L'intervention française au Mali a déplacé la menace djihadiste vers le sud"". November 18, 2013. ^ Thomas, Carls. "The Saudis channel the mafia: Fears of Saudi retaliation deter truth about 9/11". The Washington Times. Retrieved April 28, 2016. ^ Haaretz; Press, The Associated (July 11, 2017). "Fact Check: Is Qatar Supporting Terrorism? A Look at Its Ties to Iran, ISIS and the Muslim Brotherhood" – via Haaretz. ^ a b "The Chinese regime and the Uyghur dilemma" Summary of Castets, Rémi. "The Uyghurs in Xinjiang – The Malaise Grows". China Perspectives. Retrieved June 10, 2012. ^ Bergen 2006, p. 75. ^ "Bill Moyers Journal. A Brief History of Al Qaeda". PBS.com. July 27, 2007. Retrieved March 31, 2012. ^ Wright 2006, p. 270. ^ "al Qaida's Ideology". MI5. Archived from the original on February 28, 2009. Retrieved May 19, 2012. ^ "Dreaming of a caliphate". The Economist. August 6, 2011. Retrieved May 19, 2012. ^ Ranstorp, Magnus (2009). Unconventional Weapons and International Terrorism. Routledge. p. 33. ISBN 978-0-415-48439-8. ^ Lawrence Wright (2006). The Looming Tower: Al-Qaeda and the Road to 9/11. Knopf. p. 246. ISBN 0-375-41486-X. ^ J. Feiser – "Evolution of the al-Qaeda brand name". Asia Times. August 13, 2004. Archived from the original on April 23, 2005. Retrieved March 22, 2010. ^ "The Moral Logic and Growth of Suicide Terrorism – Spring 2006" (PDF). Archived from the original (PDF) on June 23, 2015. Retrieved March 22, 2010. ^ a b Blitz, James (January 19, 2010). "A threat transformed". Financial Times. Retrieved January 23, 2010. ^ "A Discussion on the New Crusader Wars: Tayseer Allouni with Usamah bin Laden". IslamicAwakening.com. Archived from the original on June 21, 2013. ^ Daniel Cassman. "Al Qaeda Kurdish Battalions". Retrieved April 12, 2016. 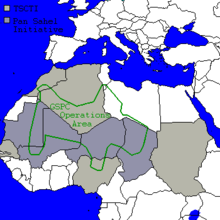 ^ "Al Qaida Linked and Africa Group Unites with Mali Extremists". December 4, 2015. Archived from the original on December 10, 2015. Retrieved June 21, 2016 – via washingtonpost.com. ^ "Al Qaeda: The Balkans Connection". Project MUSE. Retrieved April 12, 2016. ^ "BIFF, Abu Sayyaf pledge allegiance to Islamic State jihadists". GMA News Online. Retrieved April 12, 2016. ^ "Al-Qaida Says Al-Zawahri Has Succeeded Bin Laden". The New York Times. Associated Press. June 16, 2011. Retrieved June 6, 2011. ^ Walsh, Declan; Schmitt, Eric (June 5, 2012). "Drone Strike Killed No. 2 in Al Qaeda, U.S. Officials Say". The New York Times. ^ Gunaratna 2002, p. 54. ^ Basile 2004, p. 177. ^ Wechsler 2001, p. 135; cited in Gunaratna 2002, p. 63. ^ Businesses are run from below, with the council only being consulted on new proposals and collecting funds. ^ C. Glenn – The Islamists The Wilson Centre September 28, 2015 Accessed June 15, 2017 – "... Zawahiri does not claim to have direct hierarchical control over al Qaeda's vast, networked structure. Al Qaeda's core leadership seeks to centralize the organization's messaging and strategy rather than to manage the daily operations of its franchises. But formal affiliates are required to consult with al Qaeda's core leadership before carrying out large-scale attacks." ^ "Cops: London Attacks Were Homicide Blasts". Fox News Channel. July 15, 2005. Archived from the original on April 20, 2008. Retrieved June 15, 2008. ^ Bennetto, Jason; Ian Herbert (August 13, 2005). "London bombings: the truth emerges". The Independent. UK. Archived from the original on October 26, 2006. Retrieved December 3, 2006. ^ a b The Power of Nightmares, BBC Documentary. ^ McCloud, Kimberly; Osborne, Matthew (March 7, 2001). "WMD Terrorism and Usama bin Laden". CNS Reports. James Martin Center for Nonproliferation Studies. Archived from the original on May 6, 2011. Retrieved May 4, 2011. ^ "Witness: Bin Laden planned attack on U.S. embassy in Saudi Arabia". CNN. February 13, 2001. Retrieved June 12, 2007. ^ a b c Cassidy 2006, p. 9. ^ Noah, Timothy (February 25, 2009). "The Terrorists-Are-Dumb Theory: Don't mistake these guys for criminal masterminds". Slate. Archived from the original on February 27, 2009. ^ Gerges, Fawaz A (September 5, 2005). The Far Enemy: Why Jihad Went Global. Cambridge University Press. ISBN 0-521-79140-5. ^ "Today's jihadists: educated, wealthy and bent on killing?". Canada.com. July 3, 2007. Archived from the original on September 29, 2007. Retrieved March 22, 2010. ^ a b c d "History Commons". Retrieved June 21, 2016. ^ a b United States of America v. Usama bin Laden. Wikisource. Retrieved June 10, 2016. ^ Simpson, Glenn R. (March 19, 2003). "List of Early al Qaeda Donors Points to Saudi Elite, Charities". Retrieved June 21, 2016 – via Wall Street Journal. ^ a b Emerson, Steve (2006). Jihad Incorporated: A Guide to Militant Islam in the US. Prometheus Books. p. 382. ^ a b c d e f "Treasury Designates Al-Qa'ida Supporters in Qatar and Yemen". Retrieved June 21, 2016. ^ a b c d "How Qatar Is Funding al-Qaeda – and Why That Could Help the US". Retrieved June 21, 2016. ^ a b "Ban Ki-Moon shakes hands with alleged al Qaeda emir". The Long War Journal. Retrieved June 21, 2016. ^ "Terrorist paymaster targeted by Britain". Retrieved June 21, 2016. ^ a b "Security Council Al-Qaida Sanctions Committee Amends One Entry on Its Sanctions List – Meetings Coverage and Press Releases". Retrieved June 21, 2016. ^ a b "The 9/11 Commission Report" (PDF). ^ a b "IPT Exclusive: Qatar's Insidious Influence on the Brookings Institution". Qatar Daily Star. Archived from the original on May 15, 2016. Retrieved June 21, 2016. ^ Reports, CATF. "Qatar Charity, Pioneer and Master of Terror Finance". stopterrorfinance.org. Archived from the original on April 24, 2016. Retrieved June 6, 2017. ^ a b Reports, CATF. "Funding Al Nusra Through Ransom: Qatar and the Myth of "Humanitarian Principle"". stopterrorfinance.org. Archived from the original on October 9, 2017. Retrieved June 6, 2017. ^ "Syrian conflict said to fuel sectarian tensions in Persian Gulf". Retrieved June 21, 2016. ^ "Analysis: Qatar still negligent on terror finance – The Long War Journal". Retrieved June 21, 2016. ^ a b Atwan, Abdel Bari (March 11, 2005). The Secret History of Al Qaeda. University of California Press. p. 221. ISBN 0-520-24974-7. Archived from the original on May 12, 2011. Retrieved May 8, 2011 – via Google Books. ^ Musharbash, Yassir (August 12, 2005). "The Future of Terrorism: What al-Qaida Really Wants". Der Spiegel. Retrieved January 15, 2015. ^ Arabic Computer Dictionary: English-Arabic, Arabic-English By Ernest Kay, Multi-lingual International Publishers, 1986. ^ "Listen to the U.S. pronunciation". Archived from the original (RealPlayer) on December 11, 2005. ^ "Transcript of Bin Laden's October interview". CNN. February 5, 2002. Archived from the original on December 6, 2006. Retrieved October 22, 2006. ^ Bergen 2006, p. 75. Wright indirectly quotes one of the documents, based on an exhibit from the "Tareek Osama" document presented in United States v. Enaam M. Arnaout Archived February 3, 2016, at the Wayback Machine. ^ Robin Cook (July 8, 2005). "Robin Cook: The struggle against terrorism cannot be won by military means". The Guardian. UK. Archived from the original on May 14, 2011. Retrieved May 8, 2011. ^ "After Mombassa Archived May 14, 2013, at the Wayback Machine", Al-Ahram Weekly Online, January 2–8, 2003 (Issue No. 619). Retrieved September 3, 2006. ^ Wright 2006, p. 332. ^ Qutb 2003, pp. 63, 69. ^ Wright 2006, p. 79. ^ "How Did Sayyid Qutb Influence Osama bin Laden?". Gemsofislamism.tripod.com. Retrieved March 22, 2010. ^ Mafouz Azzam; cited in Wright 2006, p. 36. ^ "Sayyid Qutb's Milestones (footnote 24)". Gemsofislamism.tripod.com. Retrieved March 22, 2010. ^ EIKMEIER, DALE C. (Spring 2007). "Qutbism: An Ideology of Islamic-Fascism". Parameters. pp. 85–98. Archived from the original on June 9, 2007. ^ Kepel, Gilles (2002). Jihad: The Trail of Political Islam. Harvard University Press. ^ Jason Burke & Paddy Allen (September 10, 2009). "The five ages of al-Qaida". The Guardian. UK. Retrieved March 22, 2010. ^ "1986–1992: CIA and British Recruit and Train Militants Worldwide to Help Fight Afghan War". Cooperative Research History Commons. Archived from the original on August 18, 2013. Retrieved January 9, 2007. ^ "Maktab al-Khidamat". January 11, 2006. Archived from the original Check |url= value (help) on February 14, 2007. Retrieved February 11, 2007. ^ Gunaratna 2002, p. 19. Quotes taken from Riedel 2008, p. 42 and Wright 2006, p. 103. ^ Cloonan Frontline interview, PBS, July 13, 2005. ^ Sageman 2004, p. 35. ^ Wright 2006, p. 137. ^ "The War on Terror and the Politics of Violence in Pakistan". The Jamestown Foundation. July 2, 2004. Archived from the original on December 8, 2006. Retrieved January 9, 2007. ^ "Who Is Osama Bin Laden?". Forbes. September 14, 2001. ^ "Frankenstein the CIA created". January 17, 1999. The Guardian. ^ a b Wright 2008. ^ Wright 2006, pp. 133–34. ^ Wright 2006, p. 260. ^ Wright 2006, p. 181. ^ "Osama bin Laden: The Past". Archived from the original on February 18, 2007. Retrieved January 12, 2007. ^ Riedel 2008, p. 52. ^ Wright 2006, p. 195. ^ "Osama bin Laden: A Chronology of His Political Life". PBS. Archived from the original on December 5, 2006. Retrieved January 12, 2007. ^ "Context of 'Shortly After April 1994'". Cooperative Research History Commons. Archived from the original on August 19, 2013. Retrieved January 12, 2007. ^ Wright 2006, p. 186. ^ Ijaz, Mansoor (December 5, 2001). "Clinton Let Bin Laden Slip Away and Metastasize". Los Angeles Times. Retrieved March 22, 2010. ^ Carney, Timothy; Ijaz, Mansoor (June 30, 2002). "Intelligence Failure? Let's Go Back to Sudan". Washington Post. Retrieved March 13, 2016. ^ Rose, David (January 2002). "The Osama Files". Vanity Fair. Archived from the original on December 5, 2008. Retrieved December 1, 2008. ^ Belz, Mindy (November 1, 2003). "Clinton did not have the will to respond". World. Archived from the original on December 6, 2008. Retrieved December 1, 2008. ^ "National Commission on Terrorist Attacks Upon the United States". Govinfo.library.unt.edu. Retrieved March 22, 2010. ^ a b Rashid 2002. ^ Napoleoni 2003, pp. 121–23; Akacem 2005 "Napoleoni does a decent job of covering al-Qaida and presents some numbers and estimates that are of value to terrorism scholars"
^ Kronstadt & Katzman 2008. ^ "Al-Qaeda Core: A Case Study, p. 11" (PDF). cna.org. Archived from the original (PDF) on October 10, 2018. ^ Eisenberg, Daniel (October 28, 2001). "Secrets of Brigade 055". Time. ^ Robertson, Nic. "Sources: Taliban split with al Qaeda, seek peace". CNN. Retrieved March 22, 2010. ^ Sageman 2004, pp. 48, 51. ^ Trofimov 2006, p. 282. ^ "Bin Laden's Fatwa". Al Quds Al Arabi. August 1996. Archived from the original on January 8, 2007. Retrieved January 9, 2007. ^ Summary taken from bin Laden's May 26, 1998, interview with American journalist John Miller. Most recently broadcast in the documentary Age of Terror, part 4, with translations checked by Barry Purkis (archive researcher). ^ "Text of Fatwah Urging Jihad Against Americans". Archived from the original on April 22, 2006. Retrieved May 15, 2006. ^ Benjamin & Simon 2002, p. 117. "By issuing fatwas, bin Laden and his followers are acting out a kind of self-appointment as alim: they are asserting their rights as interpreters of Islamic law." ^ "Another wave of bombings hit Iraq". International Herald Tribune. Associated Press. September 15, 2005. Archived from the original on February 12, 2009. ^ "20 die as insurgents in Iraq target Shiites". International Herald Tribune. September 17, 2005. Archived from the original on February 12, 2009. ^ "British 'fleeing' claims al-Qaeda". Adnkronos.com. April 7, 2003. Archived from the original on May 12, 2011. Retrieved May 8, 2011. ^ "Al Qaeda leader in Iraq 'killed by insurgents'". ABC News. May 1, 2007. Archived from the original on May 12, 2011. ^ Liz Sly (February 3, 2014). "Al-Qaeda disavows any ties with radical Islamist ISIS group in Syria, Iraq". The Washington Post. Retrieved August 6, 2014. 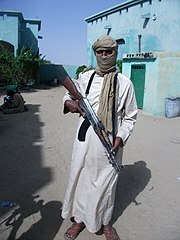 ^ "Somalia's al-Shabab join al-Qaeda". BBC. February 10, 2012. ^ "Al-Shabaab joining al Qaeda, monitor group says". CNN. February 9, 2012. Retrieved February 9, 2012. ^ Johnston, Philip (September 17, 2010). "Anwar al Awlaki: the new Osama bin Laden?". The Daily Telegraph. London. ^ "NEWS.BBC.co.uk". BBC. January 3, 2010. Archived from the original on March 23, 2010. Retrieved March 22, 2010. ^ "Al-Qaeda Slowly Makes Its Way to Somalia and Yemen". Pravda.ru. Retrieved September 23, 2009. ^ "Hunt for terrorists shifts to 'dangerous' North Africa, Panetta says". NBC News. Archived from the original on May 8, 2012. Retrieved August 5, 2013. ^ "Al Qaeda: We Planned Flight 253 Bombing Terrorist Group Says It Was In Retaliation for U.S. Operation in Yemen; Obama Orders Reviews of Watchlist and Air Safety". CBS News. December 28, 2009. Retrieved March 22, 2010. ^ Grace Wyler (March 31, 2011). "AQAP: Abyan province an "Islamic Emirate."". Business Insider. Retrieved April 12, 2016. ^ "Jihadis likely winners of Saudi Arabia's futile war on Yemen's Houthi rebels". The Guardian. July 7, 2015. ^ "Yemen conflict: Al-Qaeda joins coalition battle for Taiz". BBC. February 22, 2016. ^ a b "Report: Saudi-UAE coalition 'cut deals' with al-Qaeda in Yemen". Al-Jazeera. August 6, 2018. ^ "Bin Laden Preparing to Hijack US Aircraft and Other Attacks". Director of Central Intelligence. December 4, 1998. Archived from the original on October 15, 2012. Retrieved April 18, 2010. ^ National Commission on Terrorist Attacks (July 22, 2004). The 9/11 Commission Report (PDF) (first ed.). W. W. Norton & Company. ISBN 0-393-32671-3. ^ "Lost lives remembered during 9/11 ceremony". The Online Rocket. September 12, 2008. Archived from the original on June 29, 2011. Retrieved April 4, 2012. ^ "Imam From Va. Mosque Now Thought to Have Aided Al-Qaeda" – via www.washingtonpost.com. ^ Miller, Greg (April 6, 2010). "Muslim cleric Aulaqi is 1st U.S. citizen on list of those CIA is allowed to kill". The Washington Post. Retrieved April 9, 2010. ^ Shane, Scott (April 6, 2010). "U.S. Approves Targeted Killing of American Cleric". The New York Times. Archived from the original on April 8, 2010. Retrieved April 6, 2010. ^ Leonard, Tom (April 7, 2010). "Barack Obama orders killing of US cleric Anwar al-Awlaki". London: Telegraph (UK). Archived from the original on April 11, 2010. Retrieved April 8, 2010. ^ Dreazen, Yochi J.; Perez, Evan (May 6, 2010). "Suspect Cites Radical Imam's Writings". The Wall Street Journal. Archived from the original on May 9, 2010. Retrieved May 6, 2010. ^ Herridge, Catherine (May 6, 2010). "Times Square Bomb Suspect a 'Fan' of Prominent Radical Cleric, Sources Say". Fox News Channel. Archived from the original on May 7, 2010. Retrieved May 7, 2010. ^ Esposito, Richard; Chris Vlasto; Chris Cuomo (May 6, 2010). "Faisal Shahzad Had Contact With Anwar Awlaki, Taliban, and Mumbai Massacre Mastermind, Officials Say". The Blotter from Brian Ross. ABC News. Archived from the original on May 9, 2010. Retrieved May 7, 2010. ^ "Awlaki Not Among FBI's 'Most Wanted' Terrorists; No Reward Offered for His Capture May 24, 2010, by Patrick Goodenough". Cnsnews.com. May 24, 2010. Archived from the original on August 12, 2010. Retrieved July 17, 2010. ^ "Awlaki lands on al-Qaida suspect list". United Press International. Archived from the original on October 23, 2010. Retrieved October 30, 2010. ^ Mark Wilson (August 5, 2010). "CIA on the verge of lawsuit" (PDF). Seer Press News. ^ Rayment, Sean; Hennessy, Patrick; Barrett, David (October 30, 2010). "Yemen cargo bomb plot may have been targeted at Britain". The Daily Telegraph. London. Archived from the original on November 1, 2010. Retrieved October 31, 2010. ^ "Osama Bin Laden 'plotted to kill Obama' before death". BBC News. March 17, 2012. ^ Adams, Richard; Walsh, Declan; MacAskill, Ewen (May 1, 2011). "Osama bin Laden is dead, Obama announces". The Guardian. London. ^ a b "Osama Bin Laden Killed by US Strike". ABC News. May 1, 2011. ^ a b the CNN Wire (May 2, 2011). "How U.S. forces killed Osama bin Laden". Cable News Network. Retrieved May 2, 2011. ^ "Osama Bin Laden Killed By Navy Seals in Firefight". ABC News. Archived from the original on June 4, 2011. Retrieved May 2, 2011. ^ a b Balz, Dan (May 2, 2011). "Osama bin Laden is killed by U.S. forces in Pakistan". The Washington Post. ^ "Chitralis bewildered at OBL episode". Chitralnews.com. May 2, 2011. Retrieved May 8, 2011. ^ "Osama bin Laden, the face of terror, killed in Pakistan". CNN. May 2, 2011. Archived from the original on May 6, 2011. Retrieved May 2, 2011. ^ "Report: DNA At Mass. General Confirms bin Laden's Death". Thebostonchannel.com. February 5, 2011. Archived from the original on May 18, 2011. Retrieved May 2, 2011. ^ "Osama bin Laden Killed; ID Confirmed by DNA Testing". ABC News. May 1, 2011. ^ "US forces kill Osama bin Laden in Pakistan". MSN. ^ "Official: Bin Laden buried at sea". Yahoo! News. May 2, 2011. Archived from the original on May 4, 2011. Retrieved May 8, 2011. ^ "U.S. forces kill elusive terror figure Osama Bin Laden in Pakistan". CNN. May 2, 2011. ^ "Crowds celebrate Bin Laden's death". Euronews. May 2, 2011. ^ "With wary eye, Syrian rebels welcome Islamists into their ranks". The Times of Israel. October 25, 2012. ^ "Assad doubts existence of al-Qaeda". USA Today. Retrieved May 15, 2014. ^ Berezow, Alex (September 30, 2013). "Al-Qaeda Goes Global". RealClearWorld. Retrieved November 10, 2013. ^ Neumann, Peter (2014). "Suspects into Collaborators". London Review of Books. 36 (7): 19–21. Retrieved April 6, 2014. ^ "Opinion: Syria plunging Mideast into sectarian war?". CNN. September 4, 2013. ^ Cowell, Alan. "Syria – Uprising and Civil War". The New York Times. Retrieved November 10, 2013. ^ "Syria: On the frontline with the Free Syrian Army in Aleppo". FRANCE 24. Retrieved November 10, 2013. ^ "Al Nusra Front, an al Qaeda branch, and the Free Syrian Army jointly seize border crossing". The Washington Times. September 30, 2013. Retrieved November 10, 2013. ^ "Al-Qaeda disavows ISIS militants in Syria". BBC News. February 3, 2014. ^ a b "Gulf allies and ‘Army of Conquest’". Al-Ahram Weekly. May 28, 2015. ^ Erin Banco (April 11, 2015). "Jabhat Al-Nusra And ISIS Alliance Could Spread Beyond Damascus". International Business Times. ^ "ISIS joins other rebels to thwart Syria regime push near Lebanon". The Sacramento Bee. McClatchy DC. March 4, 2014. ^ a b Kim Sengupta (May 12, 2015). "Turkey and Saudi Arabia alarm the West by backing Islamist extremists the Americans had bombed in Syria". The Independent. ^ "Syria's al-Qaeda offshoot Nusra stages suicide bombing in Aleppo: monitor". Reuters. July 6, 2015. ^ "Russia launches media offensive on Syria bombing". BBC News. October 1, 2015. ^ Raf Pantucci (November 15, 2016). "Russia launches major offensive in Syria with airstrikes on Idlib and Homs, as rebel-held east Aleppo bombarded for first time in weeks". The Telegraph. ^ Moore, Jack (January 25, 2016). "ISIS ideologue calls al-Qaeda the 'Jews of jihad' as rivalry continues". Newsweek. Retrieved March 2, 2016. ^ "India security alert after Al Qaeda calls for jihad in subcontinent". India Gazette. September 4, 2014. Retrieved September 8, 2014. ^ "Indian Muslims Reject al-Qaida call for Jihad". India Gazette. September 6, 2014. Retrieved September 8, 2014. ^ "Al Qaeda launches India wing: 'Pakistan Army, ISI targeting India to hit Nawaz Sharif'". Zee News. Retrieved October 25, 2014. ^ "al-Qaeda's wing in India: Pakistan's ISI exposed over threatening video". news.oneindia.in. Retrieved October 25, 2014. ^ "Danger from ISIS and Al Qaeda: What India should do". news.oneindia.in. Retrieved October 25, 2014. ^ Eichenwald, Kurt (December 10, 2001). "A Nation Challenged: The Money; Terror Money Hard to Block, Officials Find". The New York Times. Retrieved May 4, 2011. ^ Wright 2006, p. 174. ^ Tom Leonard (December 25, 2009). "Osama bin Laden came within minutes of killing Bill Clinton". The Daily Telegraph. London. Archived from the original on December 25, 2009. Retrieved December 25, 2009. ^ "Jihad Against Jews and Crusaders". February 23, 1998. Retrieved June 16, 2010. ^ "Bin Laden says he wasn't behind attacks". CNN. September 17, 2001. Archived from the original on July 5, 2006. Retrieved July 6, 2006. ^ Esposito 2002, p. 22. ^ Tremlett, Giles (September 9, 2002). "Al-Qaida leaders say nuclear power stations were original targets". The Guardian. UK. Archived from the original on January 22, 2007. Retrieved January 11, 2007. ^ "Al Qaeda Scaled Back 10-Plane Plot". The Washington Post. June 17, 2004. Retrieved January 11, 2007. ^ Australian Government. "Listing of Terrorist Organisations". Archived from the original on February 4, 2014. Retrieved July 3, 2006. ^ "Armed group neutralized in Azerbaijan linked to Al-Qaeda". en.trend.az. Retrieved June 21, 2014. ^ "Is Radical Islam a Threat for Belarus? - BelarusDigest". Retrieved January 11, 2019. ^ Alfredo Sirkis. "O Brasil e o terrorismo internacional". Retrieved February 22, 2014. ^ Public Safety and Emergency Preparedness Canada. "Entities list". Archived from the original on November 19, 2006. Retrieved July 3, 2006. ^ Commission of the European Communities (October 20, 2004). "Communication from the Commission to the Council and the European Parliament". Archived from the original (DOC) on June 14, 2007. Retrieved June 11, 2007. ^ "La France face au terrorisme" (PDF) (in French). Secrétariat général de la défense nationale (France). Archived from the original (PDF) on August 7, 2011. Retrieved August 6, 2009. ^ "The Hindu : Centre bans Al-Qaeda". Hinduonnet.com. April 9, 2002. Archived from the original on April 27, 2009. Retrieved March 22, 2010. ^ "Indonesia's Long Battle With Islamic Extremism". Time. Retrieved January 11, 2019. ^ Moody, John (June 12, 2007). "Iran Wants to Talk With U.S.; Just Not About Nukes". Fox News. Archived from the original on December 25, 2013. Retrieved July 31, 2017. ^ "Criminal Justice (Terrorist Offences) Act 2005". 2005. Department of Justice Ireland. Archived from the original on May 27, 2014. Retrieved May 26, 2014. ^ "Summary of indictments against Al-Qaeda terrorists in Samaria". Israel Ministry of Foreign Affairs. March 21, 2006. Retrieved May 4, 2011. ^ Diplomatic Bluebook (2002). "B. Terrorist Attacks in the United States and the Fight Against Terrorism" (PDF). Archived (PDF) from the original on June 14, 2007. Retrieved June 11, 2007. ^ "Fight against terrorism and extremism in Kazakhstan". Mfa.gov.kz. Archived from the original on November 14, 2015. Retrieved November 23, 2015. ^ Caravanserai. "Kyrgyzstan to publicise list of banned terrorist groups". Caravanserai. Retrieved January 11, 2019. ^ NATO. "Press Conference with NATO Secretary General, Lord Robertson". Archived from the original on October 26, 2006. Retrieved October 23, 2006. ^ NATO Library (2005). "AL QAEDA" (PDF). Archived (PDF) from the original on June 14, 2007. Retrieved June 11, 2007. ^ General Intelligence and Security Service. "Annual Report 2004" (PDF). Archived from the original (PDF) on June 14, 2007. Retrieved June 11, 2007. ^ New Zealand Government. "New Zealand's designated terrorist individuals and organisations". Archived from the original on October 7, 2008. Retrieved October 7, 2008. ^ "ABUS, AL-QAEDA TAGGED IN WEDNESDAY NIGHT ZAMBOANGA BOMBING". newsflash. October 4, 2002. Retrieved March 22, 2010. ^ "Russia Outlaws 17 Terror Groups; Hamas, Hezbollah Not Included". Archived from the original on November 14, 2006. ^ Korean Foreign Ministry (August 14, 2007). "Seoul confirms release of two Korean hostages in Afghanistan". Archived from the original on December 15, 2007. Retrieved September 16, 2007. ^ Ministry for Foreign Affairs Sweden (March – June 2006). "Radical Islamist Movements in the Middle East" (PDF). Archived from the original (PDF) on June 14, 2007. Retrieved June 11, 2007. ^ "Report on counter-terrorism submitted by Switzerland to the Security Council Committee established pursuant to resolution 1373 (2001)" (PDF). December 20, 2001. Archived from the original (PDF) on June 9, 2007. Retrieved June 11, 2007. ^ "Terörle Mücadele ve Harekat Dairesi Başkanlığı". Archived from the original on January 14, 2013. Retrieved April 12, 2016. ^ "مجلس الوزراء يعتمد قائمة التنظيمات الإرهابية. - WAM". November 17, 2014. Archived from the original on November 17, 2014. ^ "Security Council Resolutions Related to the Work of the Committee Established Pursuant to Resolution 1267 (1999) Concerning Al-Qaida and the Taliban and Associated Individuals and Entities". United Nations Security Council. Archived from the original on January 12, 2007. Retrieved January 9, 2007. ^ United States Department of State. "Foreign Terrorist Organizations (FTOs)". Archived from the original on June 28, 2006. Retrieved July 3, 2006. ^ "Vietnamese-born al-Qaeda recruit sentenced to 40 years in US over plot to bomb Heathrow". South China Morning Post. May 28, 2016. Retrieved January 11, 2019. ^ "US Jets Pound Targets Around Kabul". The Portsmouth Herald. October 15, 2001. Retrieved July 25, 2012. ^ "Blair to Taliban: Surrender bin Laden or surrender power". Canadian Broadcasting Corporation. October 3, 2001. Retrieved March 22, 2010. ^ "U.S. Releases Videotape of Osama Bin Laden". December 13, 2001. Archived from the original on June 25, 2006. Retrieved July 4, 2006. ^ Morris, Steven (December 15, 2001). "US urged to detail origin of tape". The Guardian. UK. Retrieved July 11, 2006. ^ "Transcript of Osama bin Laden videotape". Archived from the original on February 2, 2007. ^ "National Commission on Terrorist Attacks Upon the United States". September 20, 2004. Archived from the original on April 27, 2006. Retrieved April 27, 2006. ^ "Full transcript of bin Ladin's speech". Al Jazeera. November 1, 2004. Archived from the original on July 11, 2006. Retrieved July 12, 2006. ^ Shane, Scott (June 22, 2008). "Inside the interrogation of a 9/11 mastermind". The New York Times. pp. A1, A12–A13. Retrieved September 5, 2009. ^ Rosenberg, Carol (April 30, 2018). "Lawyers: Scan suggests alleged 9/11 plotter suffered head injury in CIA custody". Miami Herald. Retrieved February 2, 2019. ^ Gunaratna, Rohan (2002). Inside Al Qaeda: Global Network of Terror. Columbia University Press. p. 147. Retrieved February 2, 2019. The Al Qaeda team included Abu Talha al-Sudani, Saif al- Islam el-Masry, Salem el-Masry, Saif al-Adel and other trainers, including Abu Jaffer el- Masry, the explosives expert who ran the Jihad Wal camp Afghanistan. In addition to developing this capability with Iranian assistance, Al Qaeda also received a large amount of explosives from Tran that were used in the bombng of he East African targets. The training team brought Hezbollah training and propaganda videos with the intention of passing on their knowledge to other Al Qaeda members and Islamist groups. ^ Paul Rogers (August 8, 2013). "Al-Qaida – A Multiform Idea". Oxford Research Group. Archived from the original on November 10, 2013. Retrieved November 10, 2013. ^ Black, Ian; Norton-Taylor, Richard (September 18, 2009). 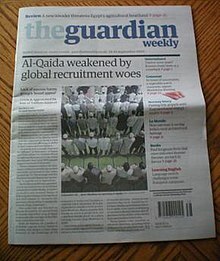 "Al-Qaida weakened by global recruitment woes". The Guardian Weekly. 181 (14). London. pp. 1–2. Retrieved September 19, 2009. Trofimov, Yaroslav (August 15, 2009). "Islamic rebels gain strength in the Sahara". The Wall Street Journal. 254 (39). p. A9. Retrieved September 15, 2009. Trofimov, Yaroslav (August 17, 2009). "Islamic rebels gain strength in the Sahara". The Wall Street Journal Europe. 27 (136). p. 12. Trofimov, Yaroslav (August 18, 2009). "Islamic rebels gain in the Sahara". The Wall Street Journal Asia. 33 (245). p. 12. ^ Riedel 2008, p. 126. ^ Meo, Nick (October 31, 2011). "Libya: revolutionaries turn on each other as fears grow for law and order". The Daily Telegraph. London. Retrieved November 10, 2013. ^ "Libyans storm Ansar Al-Shariah compound in backlash after attack on US Consulate". Fox News Channel. September 21, 2012. Retrieved November 10, 2013. ^ "Sources: 3 al Qaeda operatives took part in Benghazi attack". CNN. May 4, 2013. Retrieved November 10, 2013. ^ "U.S. forces raid terror targets in Libya, Somalia". CNN. October 6, 2013. Retrieved November 10, 2013. ^ "Last words of a terrorist | The Observer". The Guardian. Retrieved November 10, 2013. ^ View all comments that have been posted about this article. "Washington Post – Al-Qaeda's Hand in Istanbul Plot". The Washington Post. Retrieved March 22, 2010. ^ "Msn News – Bin Laden allegedly planned attack in Turkey – Stymied by tight security at U.S. bases, militants switched targets". MSNBC. December 17, 2003. Retrieved March 22, 2010. Gardham, Duncan (September 8, 2009). "Gang is brought to justice by most complex operation since the war". The Daily Telegraph. London. p. 2. Retrieved September 15, 2009. Gardham, Duncan (September 16, 2009). "Complex operation brings gang to justice". The Weekly Telegraph. Australian edition, issue 947. p. 9. ^ Milmo, Cahal (September 8, 2009). "Police watched the plot unfold, then pounced". The Independent. London. pp. 2–4. Retrieved September 15, 2009. ^ Press, Associated (September 7, 2009). "UK court convicts 3 of plot to blow up airliners". The Jerusalem Post. Archived from the original on May 12, 2011. Retrieved May 8, 2011. ^ Sandford, Daniel (September 7, 2009). "UK | Airline plot: Al-Qaeda connection". BBC News. Retrieved March 22, 2010. ^ Elder, Miriam (October 3, 2012). "Russia accuses al-Qaida of 'forest jihad' in Europe". The Guardian. London. Retrieved November 6, 2012. ^ Weir, Shelagh (July – September 1997). "A Clash of Fundamentalisms: Wahhabism in Yemen". Middle East Report (204). Middle East Research and Information Project. Archived from the original on October 3, 2008. Retrieved January 19, 2009. ; cited in Burke, Jason (2003). Al-Qaeda: Casting a Shadow of Terror. New York: I.B. Tauris. pp. 128–29. ISBN 1-85043-396-8. ^ Riedel 2008, p. 100. Al-Shishani, Murad Batal (November 17, 2005). "Al-Zarqawi's Rise to Power: Analyzing Tactics and Targets". Jamestown Foundation Terrorism Monitor. 3 (22). ^ Streatfeild, Dominic (January 7, 2011). "How the US let al-Qaida get its hands on an Iraqi weapons factory". The Guardian. UK. Archived from the original on January 7, 2011. Retrieved January 7, 2011. ^ "CSI Urges Obama to Protect Iraq's Endangered Christian Community". PR Newswire. November 1, 2010. Retrieved July 6, 2014. ^ "Iraqi Christians Mourn 58 Dead in Church Siege". CBS News. November 1, 2010. ^ a b Gunaratna 2002, p. 150. ^ "'Army of Conquest' rebel alliance pressures Syria regime". Yahoo News. April 28, 2015. ^ United Nations High Commissioner for Refugees (July 2, 2008). "Freedom in the World 2008 – Kashmir Pakistan, 2 July 2008". Unhcr.org. Archived from the original on May 12, 2011. Retrieved May 8, 2011. ^ "Osama men plan to target Delhi: Kathmandu receives threat]". Dawn. November 10, 2001. Archived from the original on April 18, 2002. ^ "Army of Madinah in Kashmir" (PDF). nefafoundation.org. Nine Eleven Finding Answers Foundation. Archived from the original (PDF) on May 3, 2012. Retrieved June 6, 2017. ^ Bruce Riedel. "Al Qaeda Strikes Back". The Brookings Institution. Archived from the original on June 5, 2011. Retrieved April 12, 2016. ^ "Lashkar-e-Taiba threat revived after Chicago arrest". Dawn. November 20, 2009. Archived from the original on November 23, 2009. ^ "US drones killed two terrorist leaders in Pak". Dawn. September 17, 2009. Archived from the original on September 23, 2009. ^ "US charges Ilyas Kashmiri in Danish newspaper plot". Dawn. January 15, 2010. Archived from the original on January 18, 2010. ^ "Al Qaeda could provoke new India-Pakistan war: Gates". Dawn. January 20, 2010. Archived from the original on January 23, 2010. ^ Thomas, Timothy (February 14, 2007). "Al Qaeda and the Internet: The Danger of Cyberplanning" (PDF). Archived from the original (PDF) on March 26, 2003. ^ Scheuer, Michael (January 2008). "Bin Laden Identifies Saudi Arabia as the Enemy of Mujahideen Unity". Terrorism Focus. Jamestown Foundation. Archived from the original on June 25, 2007. ^ Whitlock, Craig (August 8, 2005). "Briton Used Internet As His Bully Pulpit". The Washington Post. p. A1. Retrieved September 4, 2009. ^ "Babar Ahmad Indicted on Terrorism Charges". United States Attorney's Office District of Connecticut. October 6, 2004. Archived from the original on May 26, 2006. Retrieved May 29, 2006. ^ "British cyber-jihadist Babar Ahmad jailed in US". BBC News. Retrieved July 6, 2015. ^ Schmitt, Eric; Schmidt, Michael S. (September 29, 2013). "Qaeda Plot Leak Has Undermined U.S. Intelligence". The New York Times. ^ Gaynor, Tim (January 13, 2010). "Al Qaeda linked to rogue aviation network". Reuters. Retrieved May 8, 2011. ^ "US allies, Al Qaeda battle rebels in Yemen". Fox News. August 7, 2018. ^ "Allies cut deals with al Qaeda in Yemen to serve larger fight with Iran". San Francisco Chronicle. August 6, 2018. ^ Cook, Robin (July 8, 2005). "The struggle against terrorism cannot be won by military means". The Guardian. UK. Archived from the original on July 10, 2005. Retrieved July 8, 2005. ^ Akram, Munir (January 19, 2008). "Pakistan, Terrorism and Drugs". Opinion. The New York Times. Retrieved October 17, 2009. ^ Coll 2005, pp. 145–46, 155–56. ^ Bergen, Peter. "Bergen: Bin Laden, CIA links hogwash". CNN. Archived from the original on August 21, 2006. Retrieved August 15, 2006. ^ "Frankenstein the CIA created". The Guardian. January 17, 1999. ^ "Saudi Arabia, UAE gave US arms to al-Qaeda-linked groups: Report". al-Jazeera. February 5, 2019. ^ Atkins, Stephen E. (2011). The 9/11 Encyclopedia. ABC-CLIO. p. 540. ISBN 978-1598849219. ^ Ritter, Karl (April 20, 2012). "Breivik Studied al-Qaeda Attacks". Time. Archived from the original on May 25, 2012. Retrieved May 8, 2012. ^ "Norway: Militant Studied Al Qaeda". The New York Times. April 20, 2012. Retrieved May 8, 2012. ^ Bergen & Cruickshank 2008; Wright 2008. Quotes taken from Riedel 2008, pp. 106–07 and Bergen & Cruickshank 2008. ^ "Libya releases scores of prisoners". English.aljazeera.net. April 9, 2008. Archived from the original on July 18, 2008. Retrieved March 22, 2010. ^ Bergen & Cruickshank 2008. ^ "Taking Stock of the War on Terror". Realclearpolitics.com. May 22, 2008. Retrieved March 22, 2010. ^ "December 18, 2007 Poll: Most Saudis oppose al Qaeda". CNN. December 18, 2007. Retrieved March 22, 2010. ^ "New release from the Global Islamic Media Front: "Lies in Disguise: A Response From the Deep Heart of a Mujāhid of the Lions of Islām in Somalia"". June 6, 2017. ^ SITE. "ISIS Spokesman Declares Caliphate, Rebrands Group as "Islamic State"". news.siteintelgroup.com. ^ "al-Furqān Media presents a new audio message from the Islamic State's Shaykh Abū Muḥammad al 'Adnānī al-Shāmī: "This Is the Promise Of God"". June 29, 2014. Mura, Andrea (2015). The Symbolic Scenarios of Islamism: A Study in Islamic Political Thought. London: Routledge. Al-Bahri, Nasser (2013). Guarding bin Laden: My Life in Al-Qaeda. London: Thin Man Press. ISBN 978-0-9562473-6-0. Atran, Scott (2010). Talking to the Enemy: Faith, Brotherhood, and the (un)making of Terrorists. New York: Ecco Press. ISBN 978-0-06-134490-9. Atwan, Abdel Bari (2006). The Secret History of al Qaeda. Berkeley, CA: University of California Press. ISBN 978-0-520-24974-5. Atwan, Abdel Bari (2012). After Bin Laden: Al-Qaeda, The Next Generation. London/New York: Saqi Books (London)/ New Press (New York). ISBN 9780863564192. ISBN 978-1595588999. Basile, Mark (May 2004). "Going to the Source: Why Al Qaeda's Financial Network Is Likely to Withstand the Current War on Terrorist Financing". Studies in Conflict and Terrorism. 27 (3): 169–185. doi:10.1080/10576100490438237. Benjamin, Daniel; Simon, Steven (2002). The Age of Sacred Terror (1st ed.). New York: Random House. ISBN 0-375-50859-7. Bergen, Peter (2001). Holy War, Inc.: Inside the Secret World of Osama bin Laden (1st ed.). New York: Free Press. ISBN 0-7432-3495-2. Bergen, Peter (2006). The Osama bin Laden I Know: An Oral History of al Qaeda's Leader (2nd ed.). New York: Free Press. ISBN 0-7432-7892-5. Bergen, Peter; Cruickshank, Paul (June 11, 2008). "The Unraveling: The jihadist revolt against bin Laden". The New Republic. 238 (10). pp. 16–21. Retrieved May 4, 2011. Bergen, Peter (2011). The Longest War: The Enduring Conflict between America and al-Qaeda. New York: Free Press. ISBN 978-0-7432-7893-5. Bin Laden, Osama (2005). Lawrence, Bruce (ed.). Messages to the World: The Statements of Osama bin Laden. London: Verso. ISBN 1-84467-045-7. Cassidy, Robert M. (2006). Counterinsurgency and the Global War on Terror: Military Culture and Irregular War. Westport, CT: Praeger Security International. ISBN 0-275-98990-9. Coll, Steve (2005). Ghost Wars: The Secret History of the CIA, Afghanistan, and Bin Laden, from the Soviet Invasion to September 10, 2001 (2nd ed.). New York: Penguin Books. ISBN 0-14-303466-9. Esposito, John L. (2002). Unholy War: Terror in the Name of Islam. New York: Oxford University Press. ISBN 0-19-515435-5. Gunaratna, Rohan (2002). Inside Al Qaeda (1st ed.). London: C. Hurst & Co. ISBN 1-85065-671-1. Hafez, Mohammed M. (March 2007). "Martyrdom Mythology in Iraq: How Jihadists Frame Suicide Terrorism in Videos and Biographies". Terrorism and Political Violence. 19 (1): 95–115. doi:10.1080/09546550601054873. Hoffman, Bruce (2002). "The Emergence of the New Terrorism". In Tan, Andrew; Ramakrishna, Kumar (eds.). The New Terrorism: Anatomy, Trends, and Counter-Strategies. Singapore: Eastern Universities Press. pp. 30–49. ISBN 981-210-210-8. Jansen, Johannes J.G. (1997). The Dual Nature of Islamic Fundamentalism. Ithaca, NY: Cornell University Press. ISBN 0-8014-3338-X. McGeary, Johanna (February 19, 2001). "A Traitor's Tale". Time. 157 (7). pp. 36–37. Retrieved September 15, 2009. Napoleoni, Loretta (2003). Modern Jihad: Tracing the Dollars Behind the Terror Networks. London: Pluto Press. ISBN 0-7453-2117-8. Qutb, Sayyid (2003). Milestones. Chicago: Kazi Publications. ISBN 0-911119-42-6. Rashid, Ahmed (2002) . Taliban: Militant Islam, Oil and Fundamentalism in Central Asia. New Haven: Yale University Press. ISBN 1-86064-830-4. Reeve, Simon (1999). The New Jackals: Ramzi Yousef, Osama Bin Laden and the Future of Terrorism. Boston: Northeastern University Press. ISBN 1-55553-407-4. Riedel, Bruce (2008). The Search for al Qaeda: Its Leadership, Ideology, and Future. Washington, D.C.: Brookings Institution Press. ISBN 978-0-8157-7414-3. Sageman, Marc (2004). Understanding Terror Networks. Philadelphia: University of Pennsylvania Press. ISBN 0-8122-3808-7. Trofimov, Yaroslav (2006). Faith at War: A Journey On the Frontlines of Islam, From Baghdad to Timbuktu. New York: Picador. ISBN 978-0-8050-7754-4. Wechsler, William F. (2001). "Strangling The Hydra: Targeting Al Qaeda's Finances". In Hoge, James; Rose, Gideon (eds.). How Did This Happen? Terrorism and the New War. New York: PublicAffairs. pp. 129–143. ISBN 1-58648-130-4. Wright, Lawrence (2006). The Looming Tower: Al-Qaeda and the Road to 9/11. New York: Knopf. ISBN 0-375-41486-X. Wright, Lawrence (June 2, 2008). "The Rebellion Within". The New Yorker. 84 (16). pp. 36–53. Retrieved September 15, 2009. Akacem, Mohammed (August 2005). "Review: Modern Jihad: Tracing the Dollars behind the Terror Networks". International Journal of Middle East Studies. 37 (3): 444–445. doi:10.1017/S0020743805362143. Bale, Jeffrey M. (October 2006). "Deciphering Islamism and Terrorism". Middle East Journal. 60 (4): 777–788. Shaffer, R (2015). "The Terrorism, Ideology, and Transformations of Al-Qaeda". Terrorism and Political Violence. 27 (3): 581–590. doi:10.1080/09546553.2015.1055968. Kronstadt, K. Allen; Katzman, Kenneth (November 2008). "Islamist Militancy in the Pakistan-Afghanistan Border Region and U.S. Policy" (PDF). U.S. Congressional Research Service. White House (September 2003). "Progress Report on the Global War on Terrorism". United States Department of State. Archived from the original on September 22, 2003. "Al Qaeda Training Manual". U.S. Dept. of Justice. Archived from the original on March 31, 2005. "Bin Laden documents at a glance". Archived from the original on May 11, 2012. Peter Taylor. (2007). "War on the West". Age of Terror, No. 4, series 1. BBC. Adam Curtis (2004). The Power of Nightmares. BBC. "Al-Qaida collected news and commentary". The Guardian. "al-Qaeda collected news and commentary". The New York Times.